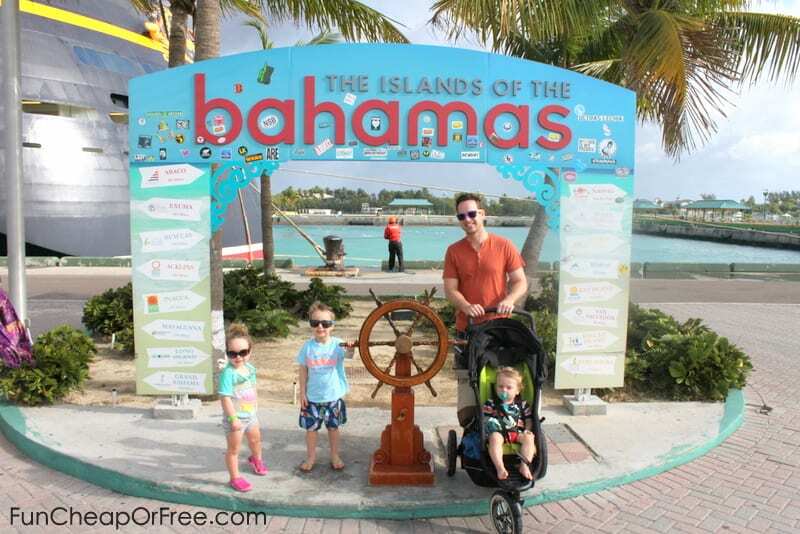 Recently my husband and I took our 3 little kids (ages 4yrs, 2.5y, and just turned 1) on a 5-night cruise to the Bahamas…and survived. In fact, we had the time of our lives and want to do it again! How did we cruise with kids and survive? What did we pack, what did it cost, how did we survive 8 hrs of airports and flights? 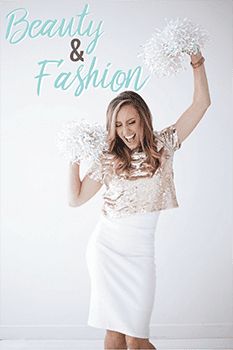 Don’t you worry…I have spent (literally) 3 weeks putting together this 3-part mega-post that will fill you in on every nitty gritty detail! 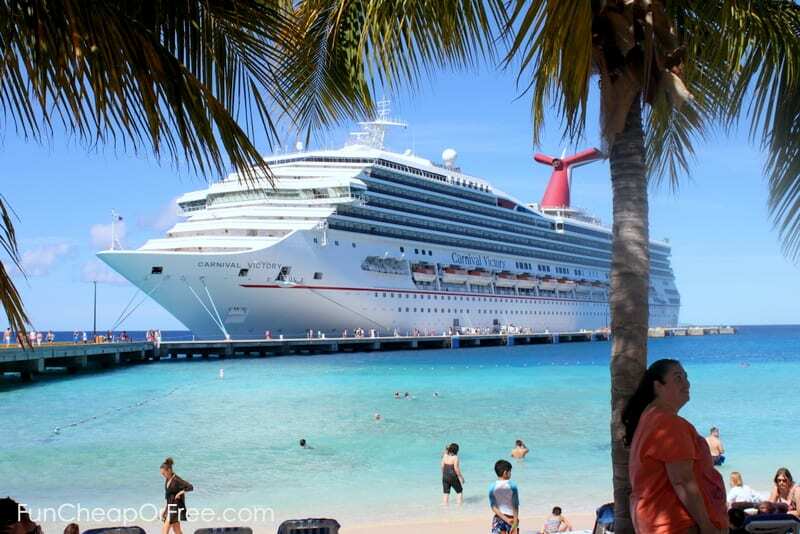 Yesterday was Part 1 which was all about finding, booking, and preparing for your cruise. 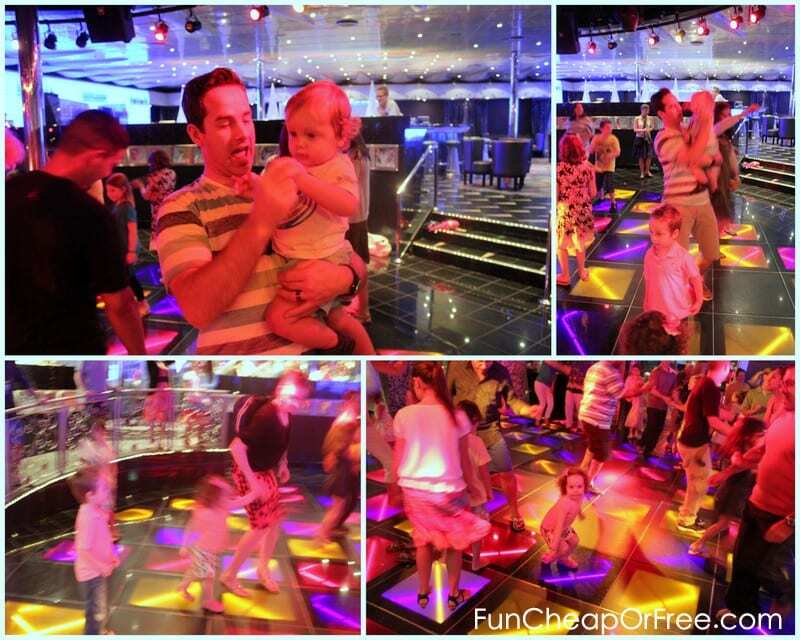 Now enjoy part 2: CRUISING WITH KIDS! Before dinner on the last night of our cruise. Part 1 covers: Booking and preparation. 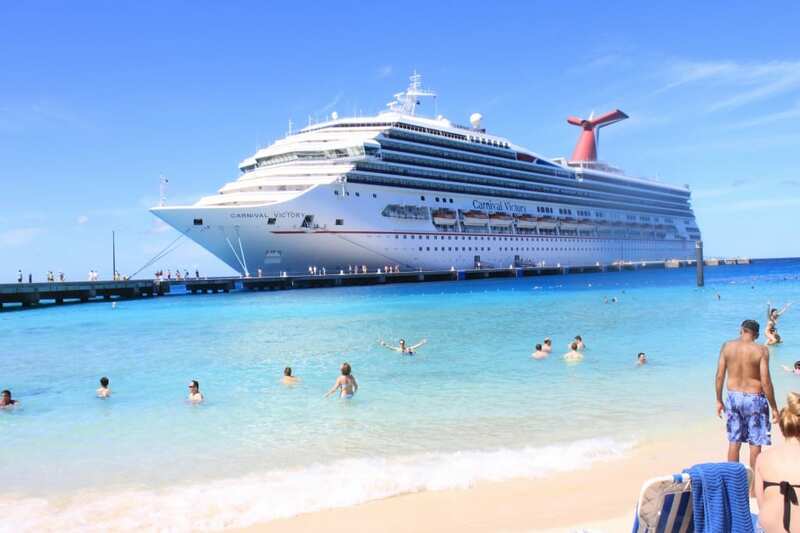 How to find the best deal on your cruise, flights, and hotels, how to book your cruise, what to pack and bring, and other trips for BEFORE YOU GO. Part 2 covers: All about cruising! 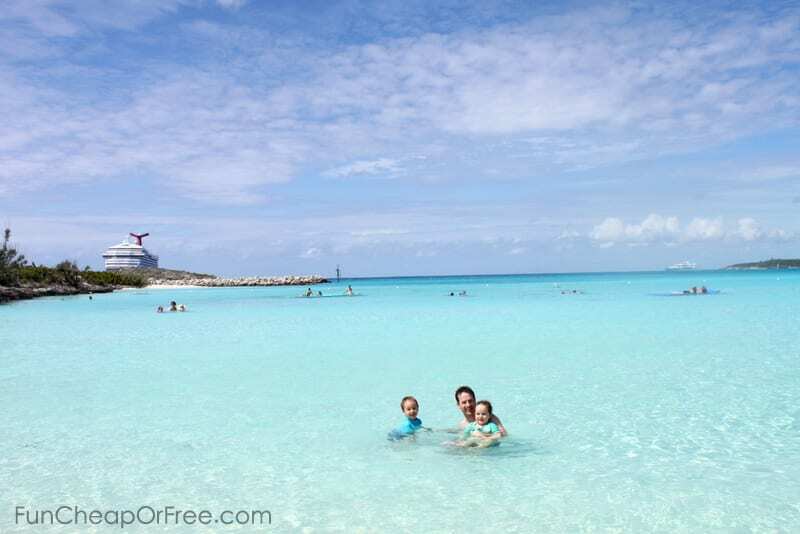 What to expect, things to do on and off the ship, how to manage cursing with kids, and a full rundown of our cruise and what it was like for us, and other trips for CRUISING WITH KIDS. Part 3 covers: Traveling survival tips. 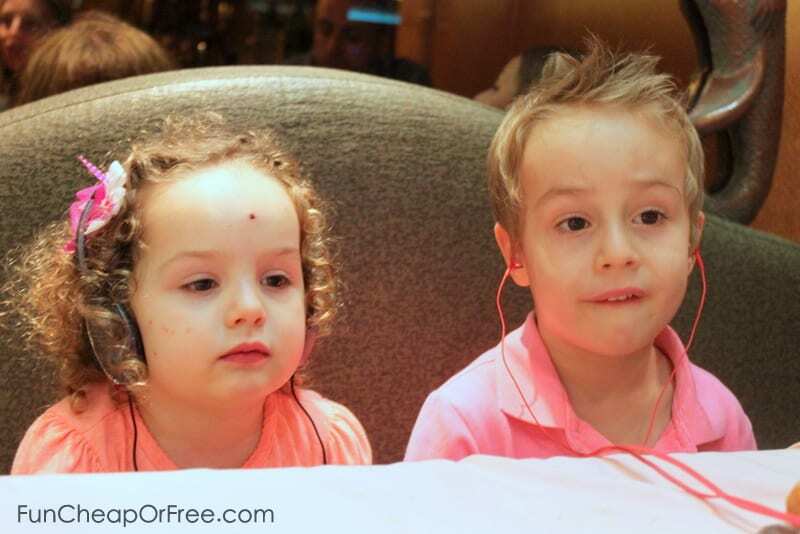 How we entertained our kids on the flights, survived the hotel stays, kept our kids behaved and happy throughout the trip, and other tips on TRAVELING WITH KIDS. Enjoy this video which summarizes the trip you are about to read about! All details on EVERYTHING below. How did we do under-water footage? See “what to bring” in part 1. 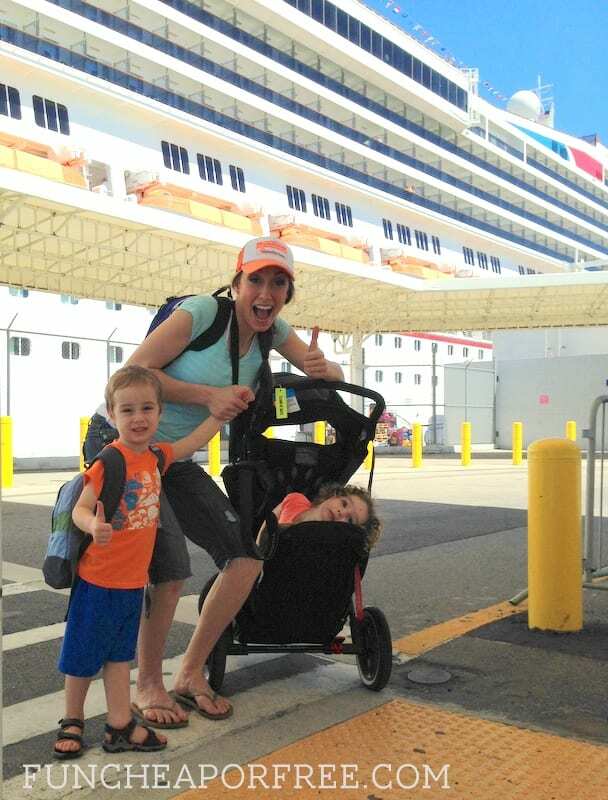 Using our personal experience, here's everything you should know about what to expect when cruising with kids! When you book your cruise you will be assigned a specific window of time to “check in” and board your ship. For us it was between 2-4pm. Someone told me you can pay extra to board early. I think that would be a waste of money, frankly. We arrived at the port right at 2:00. 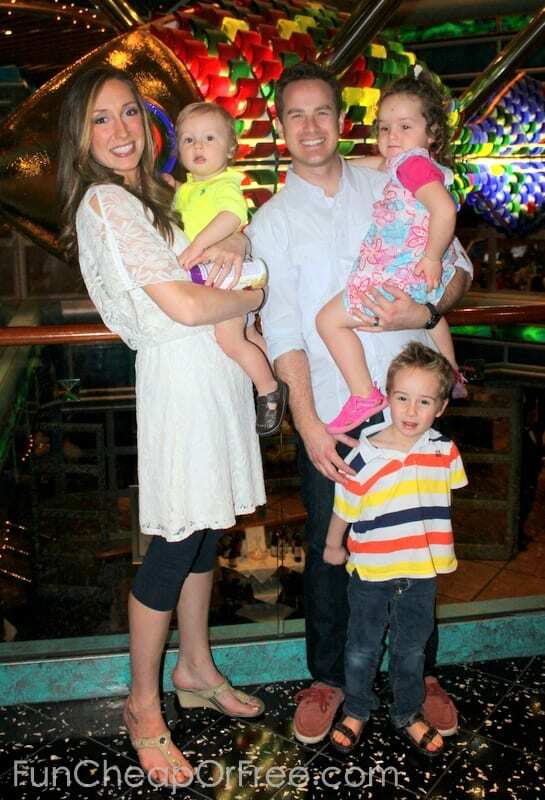 We wanted to get on the ship as early as possible so we could put the kids down for naps and eat lunch. 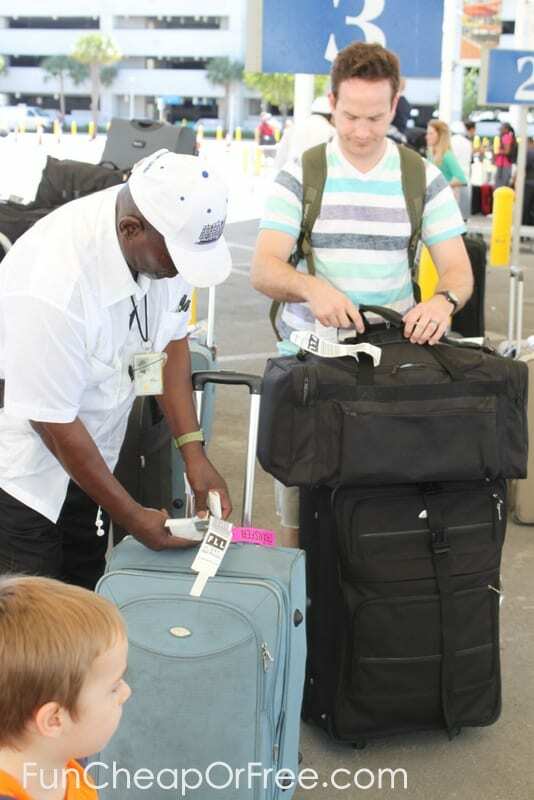 CRUISE NOTE: Be sure to tip your drivers and anyone who touches your bags. You should tip your luggage guy at least $1-$2 per bag. They take your bags at that point; you do not carry them on the ship with you (except your carry-ons). Think of it like an airport. You might not get your bags for a few hours, they will bring them to your room. Be sure to keep with you anything you'll need to tide you over until then. You go through security, just like at an airport, including taking off your shoes and running your carryon bags through x-ray machines. After security you check in, also just like at an airport. 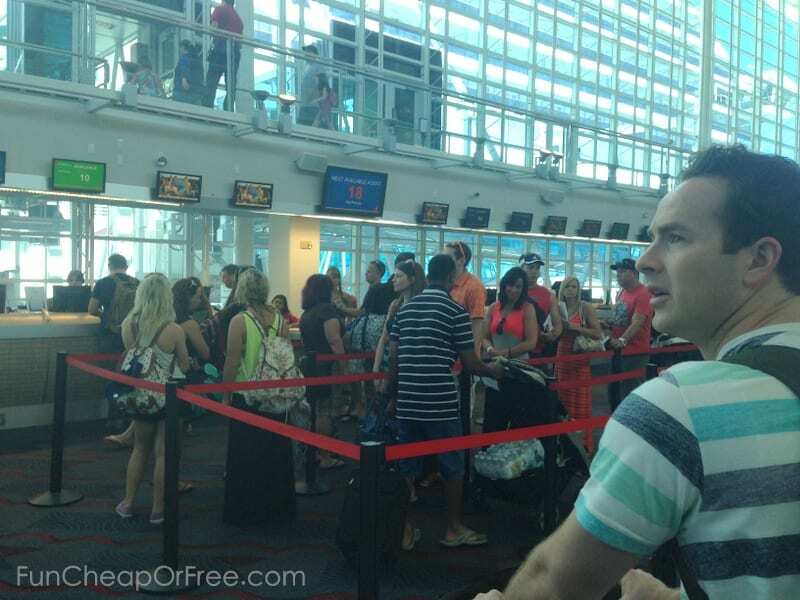 Checking in for a cruise reminds me a lot of checking in at an airport. Once on-board, you go to your room and get settled. Again, you probably won't have your luggage yet. As mentioned in Part 1, we paid $40 for the week to upgrade to an ocean view room. Worth. Every. Penny. Having a window was awesome, and it gave us TONS more room than inside rooms. Getting settled in our cabin. They pushed together two double beds to make one large bed for me and Bubba, we got a portable crib for Beck that fit between the bed and window, and Hutch and Priya took the bunk beds. CRUISE NOTE: There is no tub in the cabin bathroom, only a small shower. It has a pull-down hand-held shower head thing, so we had the big kids stand in the shower and hosed them off, then held the baby while we showered to bathe him. They provide some standard shampoo and body wash, but we definitely packed our own which was good. ANOTHER CRUISE NOTE: They do have self-service laundry rooms on-board. I didn't notice this until our last day, and it really would have come in handy. So no need to over-pack. At home our kids normally go to bed at 7pm (later in the summer) and wake up between 7-7:30am usually. All 3 of our kids nap every day, typically from 1:00-3:00 or 3:30. My kids tend to fall apart if they don't nap at home. Was I worried about that on vacation? Nah. We figured we would make it a point to get them a nap each day, and just give up some time doing other things, to make sure we all are as happy and rested as possible. My husband and I mentally prepared ourselves for early bedtimes and naps each day, knowing that traveling with kids isn't as fast-paced as traveling with adults. So it didn't really bother us. Plus, we were wiped out too and LOVED taking a nap each day! For naps and bedtime we would close the curtains, turn on the white noise (mentioned in part 1), give the baby a bottle, lay with the big kids forcing them to be quiet until they fell asleep, then we would either nap ourselves, read, or watch a movie together on the computer with headphones, sometimes ordering free room service to keep us company (yes, it's free!). TRAVEL NOTE: Don't be afraid to use sleep aid! Your trip will be ruined if you/your kids don't sleep well. See part 1 “what to bring” for my favorite all-natural sleep aid. For days off the boat, we would get off the boat as early as possible, play long and hard, then head back on-board when the kids started melting down and couldn't take it any more. It tended to be between 3-4pm. We would nap from 4-6, go to dinner from 6-8pm, then either go right to bed or watch a family-friendly show before going to bed if there was one offered that night. For the baby, if he started getting fussy we'd put him in the stroller with a bottle and try to rock him to sleep in the stroller. Sometimes it worked within seconds, sometimes it didn't work. Either way it relaxed him and was a good “rest” and would recharge him for a little while. Updated note: Be sure to read the comments in these posts because readers are leaving AMAZING advice and feedback about their own experiences! One reader said you can send your kids to the Kid's Club for dinner and as long as you pick them up before 10 it's free! Man, if I had taken the time to know that, it would've made things WAY more fun for everyone. They do activities and games and feed them dinner. Good to know for next time!! As mentioned in Part 1, basically all the food on the boat is free, including room service. This is one of my favorite parts of cruising. 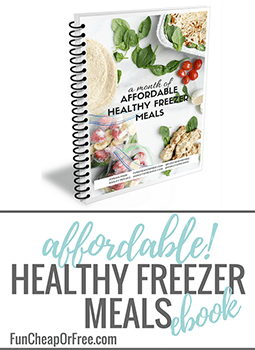 It's SO NICE not to have to buy every meal! And on our cruise the food was great! The other 3 cruises I went on were hit and miss food-wise, but I was super happy with the food on this one. There are various places to eat throughout the boat, some of them 24 hours. They had a pool-side grill with hot dogs, chicken fingers, fries, and burgers…our kids' favorite. At night you eat dinner in the main restaurant where they served fancier food. You choose the 6pm early seating, or the 8pm late seating when you book your cruise. We chose the early seating and were glad we did. Now is your time to try new things! 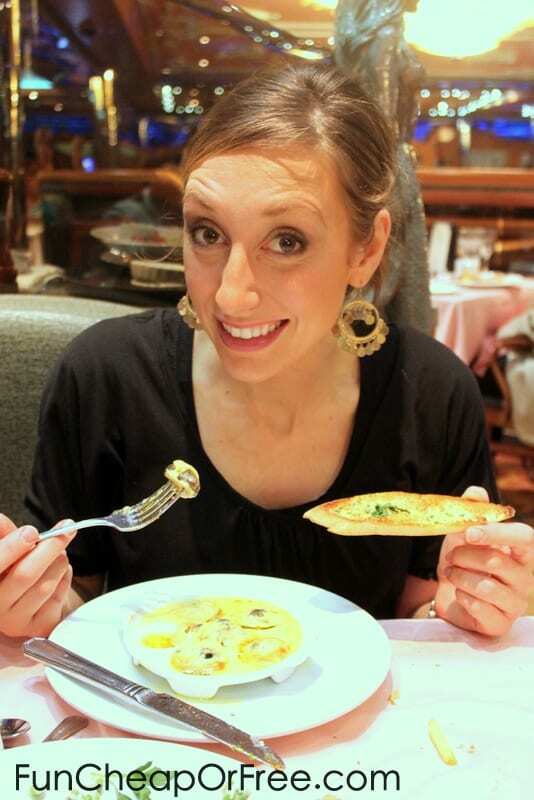 I ate Escargot and it was one of the best things I ate the entire trip. When would I ever get that chance otherwise?? Get adventurous! Turns out escargot is delicious! You better believe we tried the alligator fritters! Would I eat them again? Probably not. Was it fun to try? You bet. Don't feel bad ordering lots of things. Don't be wasteful, but again, be adventurous! Between the two of us, Bubba and I would order several appetizers and entrees each, so between the two of us we could taste everything on the menu. The appetizers come out in pretty small portions, so that was no problem. The entrees were large, so to prevent wasting food I would suggest asking your server to bring you out a smaller portion of the entree, so you can taste a variety of things without being wasteful. 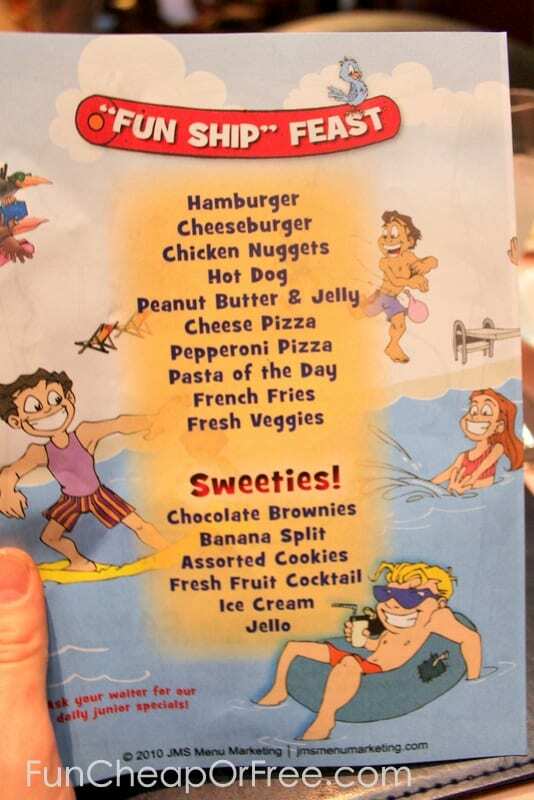 They had a kid menu which saved us. Not sure about you, but my 2 year old isn't a big fan of escargot. I'm pretty sure the kids ate chicken nuggets, fries, and a fruit cup, and a scoop of ice cream every night. Hey, it's vacation, do what works. Dinnertime was probably the hardest time of the day in terms of managing our kids. They were tired, they didn't want to sit and eat for 2 hours, they were cranky, some nights it was rough. And it seemed like every time we sat down ready to eat, one of them had to go potty! We finally figured out the system. We would have everyone go potty before we sat down, we would order the kid meals right away, the servers would bring them out asap. Once the kids were done eating we'd do another potty run, then they could watch Frozen on the iPad until dinner was over. 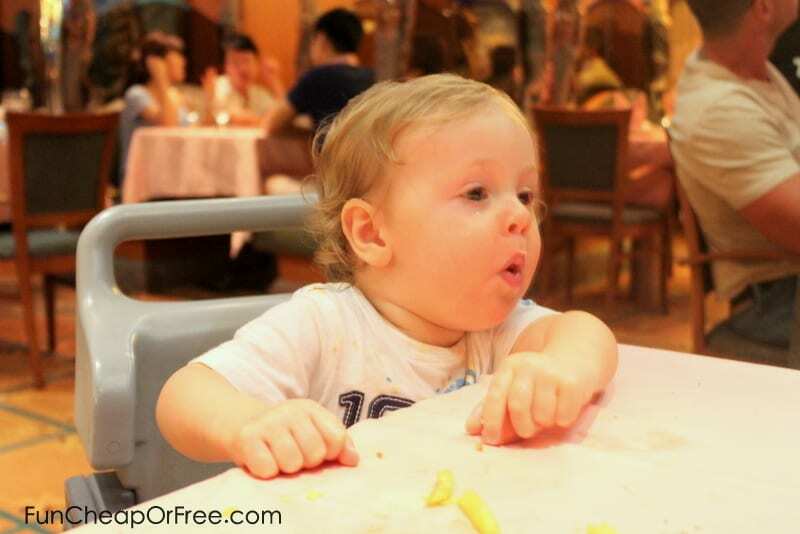 Aaahhh…silence at dinnertime. Once the kids finished their food they could watch a movie quietly on the iPad so Bubba and I could enjoy our dinner. Even the baby loved the iPad. At home, we are NOT electronics people. We don't even let our kids watch TV hardly. On vacation? You better believe we love those electronics. We're in “survival mode” I call it. 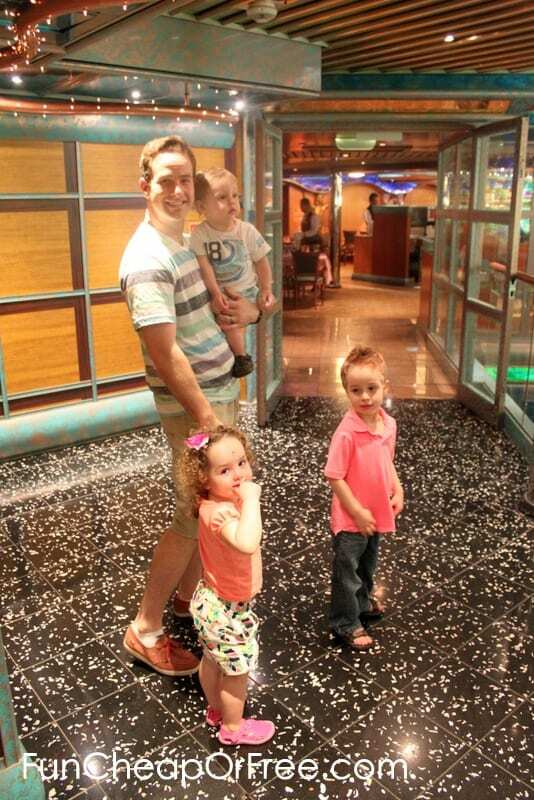 Sure, you don't want your kids to walk all over you on vacation. But I think giving in to special privileges so everyone has an enjoyable time is A-OK! We could eat in peace once the iPad was on! The staff is amazing. Please, please, please be polite and courteous to your staff. They are the hardest working crew on the planet, I swear. They were all so nice and completely doted over our kids. You have to realize, they are on the ship 5-9 months at a time…often times leaving behind kids and babies of their own. They are lucky if they get to see their kids 6-12 weeks before jumping back on another ship. So just be prepared that if you have a baby or little kids, the staff members will show them lots of extra love, mostly because they miss their own little guys back home. It was so sweet, I loved it. In fact, next time we cruise I'm going to bring a big bag of treats or trinkets to hand out to staff that serves us. I bet they would enjoy the nice gesture. Beck got lots of attention from the crew, who were all missing their own babies back home. Dinner is really fun! 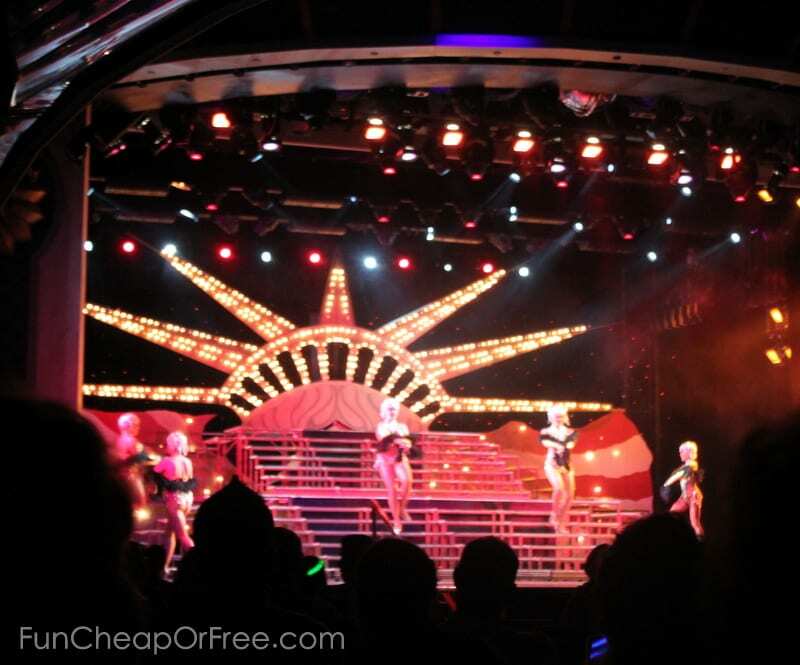 On our cruise they would flash the lights, and a few minutes later all the staff would sing and dance for us – as seen in our trip video. And no, it wasn't a waltz…it was to rap songs and club music much of the time! Haha! It was such a blast, some of my favorite parts of the trip for sure. 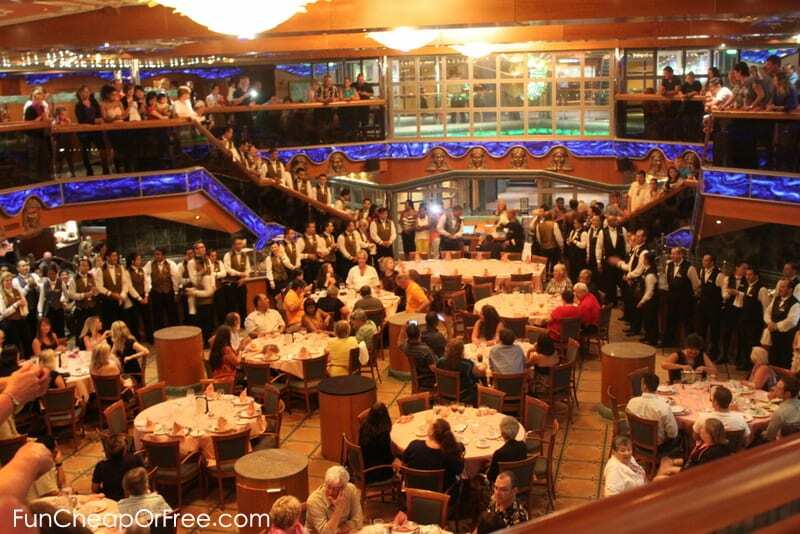 The staff would sing and dance for us each night. They even had pillars to stand and dance on. It was hysterical! On days off-board, we would go back on the ship to eat. Why pay $50+ for a meal at a restaurant, when you can walk for 10 minutes and eat a nice meal for free back on the boat? Except for the day at Half Moon Cay (Carnival's private island), because an island BBQ lunch was included on the island (more below on day 3). We would pack snacks to tide us over between meals off the boat. 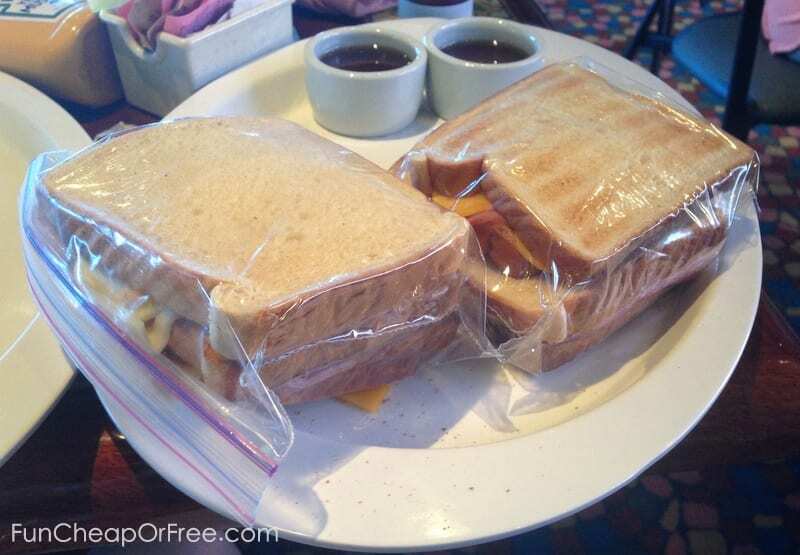 At breakfast we would grab extra toast, cold cuts, or PB&J and make sandwiches, which we put in the empty ziplock baggies I recommend bringing in part 1. We'd eat sandwiches, apples, and other food packed from the boat to eat on the beach. Camp Carnival is their on-board kid club. They have activities during the day and day care at night (more on that on day 5 below). Swimming. There are several pools on-board, and even a water slide. Unfortunately, our one day at sea was cloudy and cold (and the pool water was freezing), so we never swam in the pools. We did, however, swim in the hot tubs! “Swimming” in the hot tub since the pool was so freezing! They have an arcade on-board, but our kids were too young to be interested, and it costs extra so we tried to stick to other activities. Family-friendly shows. 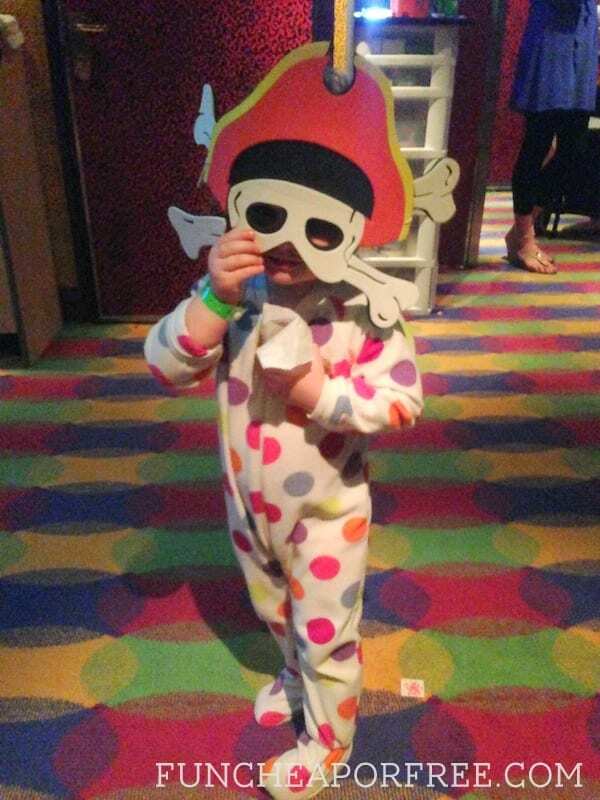 Whether it was family karaoke, a family dance party, or a family-friendly show in the theater, they had stuff for families all throughout the week. Since our kids are so little and we spent most of our days off the boat and on the beach, we really only took them to the shows in the theater. Note: even though the shows were “family friendly”, some of the costumes were pretty revealing so use your personal discretion. Luckily our kids were too young to notice! Yes, they were wearing thongs in this picture. Yikes. Each day you dock in a new place. So we decided that even if all we did was hang out at the beach the entire week, at least we'd be at a different beach each day! 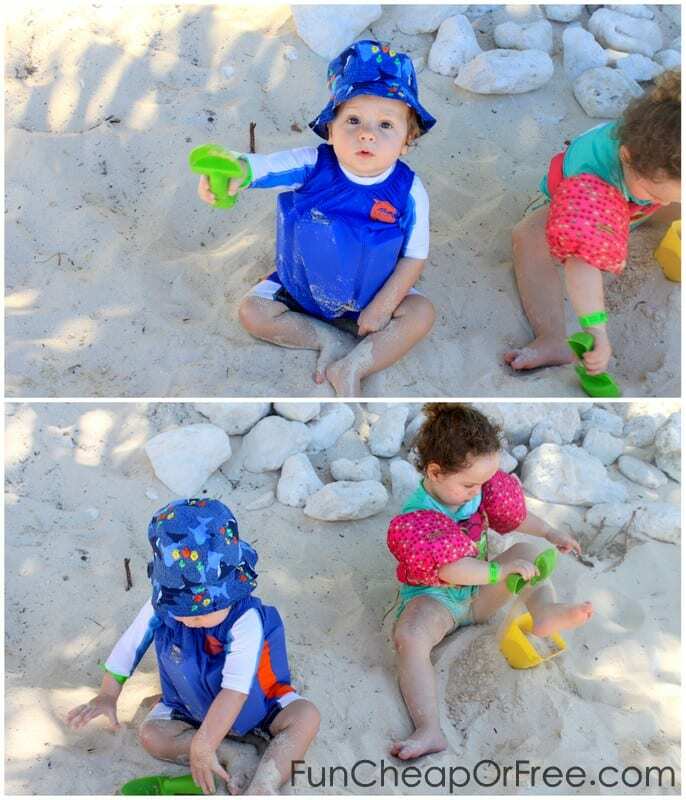 Just bring some sand toys, snorkel gear, and books to read, and you'll enjoy relaxing and playing on the beach. Beach chairs were available at every stop. At Nassau the chairs were stacked and you had to tip a guy to set it up for you. 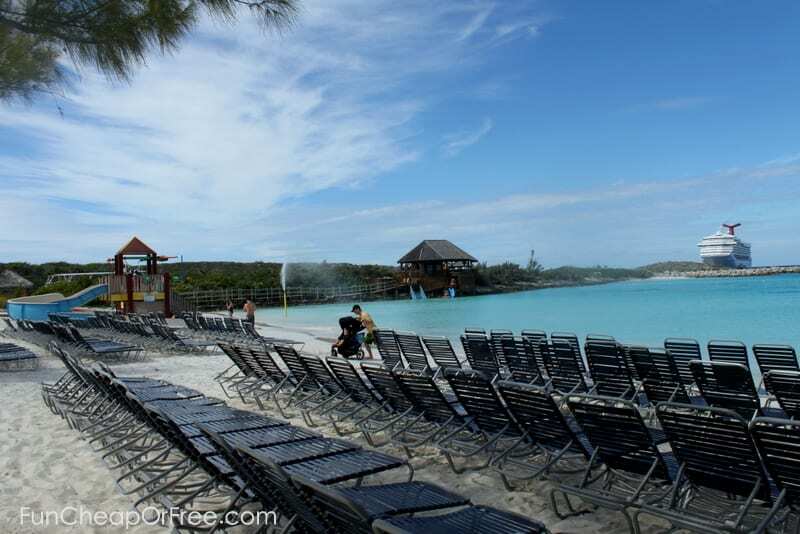 At Half Moon Cay we paid $20 to rent a big sun shade for the day because it was really hot, but otherwise the chairs were free. Excursions. Excursions are paid activities that include anything from whale-watching, to scuba diving, to banana boat-riding, and so on. You can book them before your cruise, you can book them on the ship, or you can wait unitl you're off the ship and book them. We didn't book any excursions. We figured we would take it day by day and if the mood struck us, we could find an excursion to buy. They were EVERYWHERE; there is no reason to buy them early, unless its one that sells out early. The only one we considered buying in advance was a day at the Atlantis resort in Nassau. It included lunch, tickets to the water park, and aquarium. 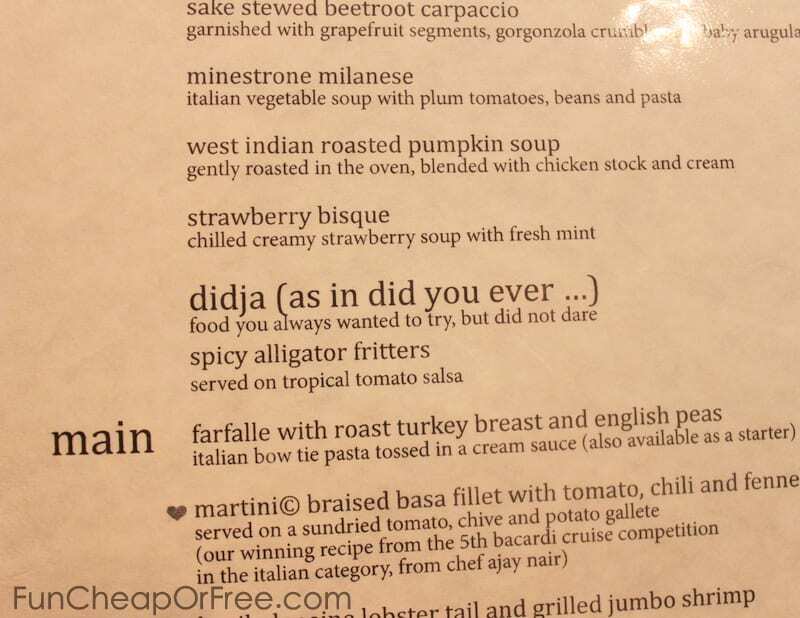 Our kids would've loved it…but at $170 per person we couldn't swallow it. Turned out it was raining off and on that day, and a lot of people left Atlantis early and went back on the boat because they were cold! So if you're traveling with kids, I might just wait and feel it out before committing to anything. 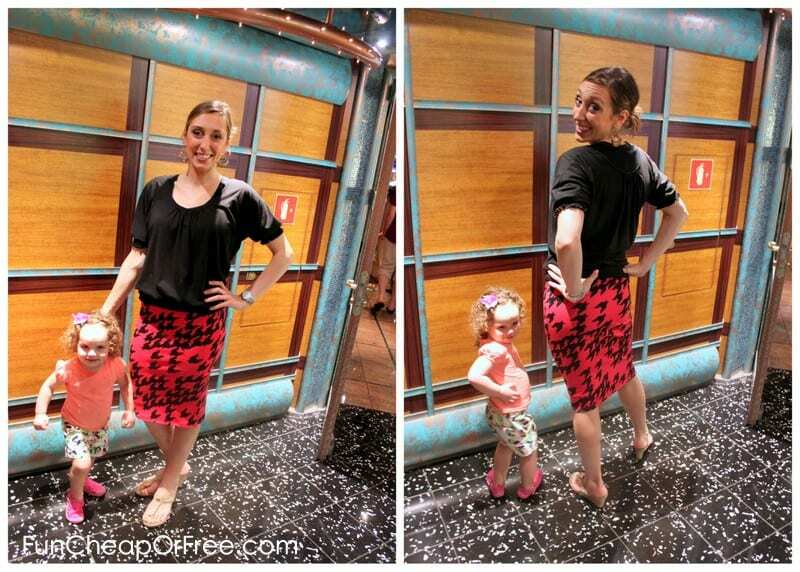 One night for dinner I opted for a stretchy, comfortable pencil skirt from Agnes and Dora. It doesn't wrinkle, can expand with my expanding belly (so much good food! ), and matched a number of things. The rest of the nights were similar. Dressy/casual – dress + leggings for me, collared shirt for Bubba and the boys, casual dress or even shorts for Priya. What we wore to dinner on night 2. Stretchy, non-wrinkle dress with leggings for me on night 3. I don't have a picture of it, but I wore this same dress in black, with black and white leggings on night 4. 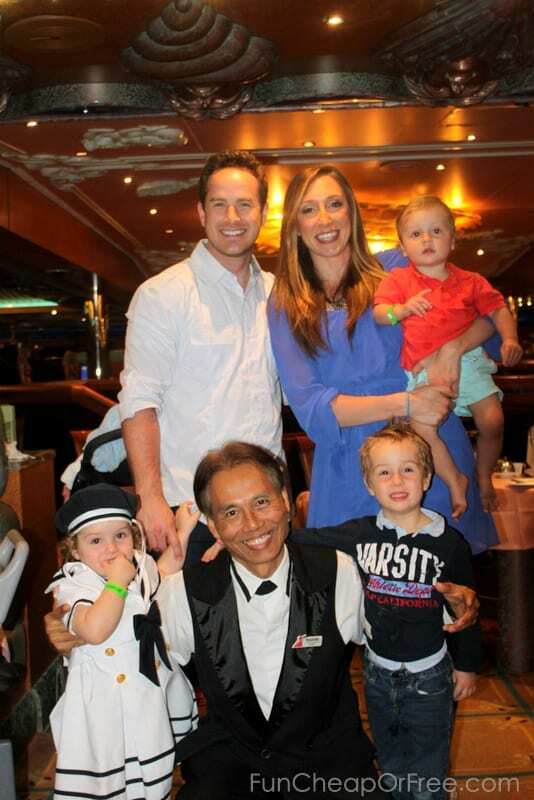 Posing for dinner on the final night with our server, “Uncle Prado” (from Indonesia), whom we all adored. Oh boy. Where to begin on this one? As parents, this is probably what we question/fear the most…how will our kids act? Will they throw fits the whole time, making the trip miserable for everyone? Will we all be at each others' throats all week? Will they love it? Hate it? Is it worth the investment and risk? Look, let's just be honest…kids are KIDS. They will not be perfect 100% of the time, nor should we expect them to. Take my kids, for example. Sometimes my kids were sweet angels on the trip. Quietly drawing, eating politely, being nice to each other. …Other times they were as if Children of the Corn and Veruka Salt had babies and graciously gave them to us. 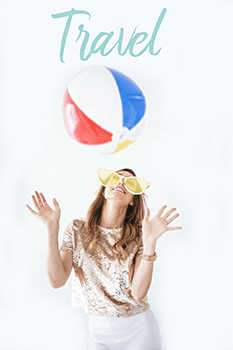 Fix behavior issues BEFORE vacation. Whatever problems you have with your kids before vacation will be amplified 2 or 3 fold on vacation. It's a fact. Overstimulation, new environment, hunger, exhaustion, being in a new element, mom and dad being extra cranky and on-edge…it all plays a factor. If your kids are terrors at home, then yes. They will be absolute terrors on the trip. If your kids don't sleep well at home, yes, they will sleep terribly on vacation. If they are loud, rude, and defiant at home…you get the point. Again, kids aren't perfect. But I highly recommend hitting your local library and checking out some books to help you work out these issues long before you set sail on an expensive vacation. A few that have worked well in our family are: A House United , Love and Logic (I read the one for toddlers specifically), and Parenting the Strong-Willed Child . Be firm, especially at the beginning of your trip. We had to abruptly remove Priya from dinner and sit with her in the cabin until she learned that it's way more fun to be polite and obedient, and enjoy dinner…rather than be naughty and sit alone in a quiet ship cabin. We did that once, and it wasn't much of an issue the rest of the trip. Be willing to follow through with your consequences. If all you issue are empty threats that you can't (or aren't willing to) keep, your kids will figure that out quickly and will use it against you the entire vacation. Find the real source of the issue. Our kids are best friends one minute, and fight like cats and dogs the next! If they were fighting we tried to figure out WHY. It was usually because they were tired, hungry, or bored. We would take them out into the hall and run races with them. We would do a lap around the ship. We should go get a snack or order room service (yes, it's free). Or we would call it an early night and get some good rest. Accept “survival mode” to an extent. At the end of the day, vacation is vacation…we just don't have as much control as we do at home. Much of our trip we declared as “survival mode” where we had to forgive some behaviors or encourage some habits (such as TV watching) that we don't allow at home, for the sake of the vacation. Stick to your guns, but loosen up a little at the same time. Watch YOUR OWN behavior. Let's get real here, traveling with kids is no cakewalk for adults. You're tired, frustrated, hot, bugged, and hungry – just like your kids are. And prepare yourself now…24 hours per day with your family stuffed in a small ship cabin can turn anyone postal after a while. But PLEASE try your hardest to avoid travel-zilla mode! I can't tell you how many couples I heard throughout our cruise (and flights) that were at each other's throats; nagging and biting at their kids, saying harsh things to their spouse, being sassy, being impatient with the people around them. How can you expect your kids to behave better, if that's the behavior you're modeling? Let me get on a soap box here. Sure, I'm definitely not perfect at this. But if there's one thing I know it's that of all the people in the world to love and respect, it better darn well be your family. So, for the love of butter PLEASE watch your tone on your vacation. Losing your cool just ruins everyone's day – including your own. Take a deep breath, order a coke, eat some chocolate, and just chill. It will all be ok. *happy place*. We good here? Good. As mentioned above, after boarding the ship around 2:00 and getting settled in our cabin, we explored the ship, grabbed some food on-deck, took naps, then got ready for dinner. The boat took off around 4:00 or 5:00. We had dinner at 6, went to the “welcome” show at 10, left the show early and put the kids to bed. DAY 2: Day at sea. As mentioned above, we woke up, got in our swimsuits, excited to eat breakfast and hit the pool. Once on deck we realized it was pretty cold, so we swam in the hot tub until lunch. We ate lunch, then went back for naps around 2. 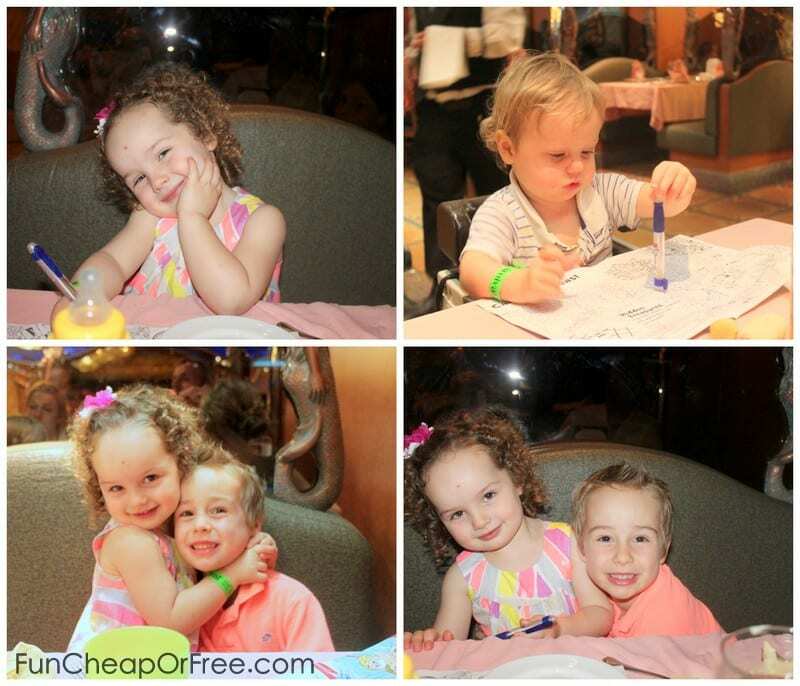 After naps we got ready for dinner, explored the ship and killed time until dinner at 6. After dinner we put the kids to bed early so we could get off the boat early the next day. Bubba and I stayed up watching a movie on his laptop with headphones. Our kids are early risers, so no alarms needed for us. We got dressed in our swimsuits and coverups, ate a good breakfast, then headed off the boat. 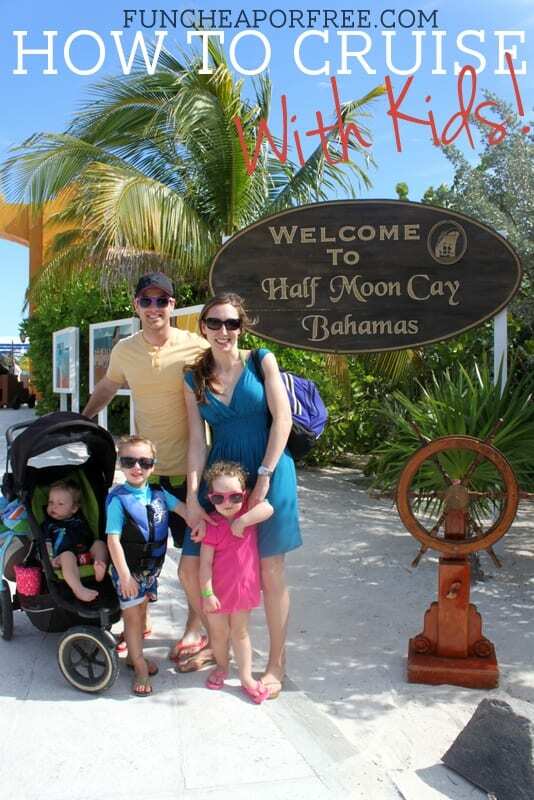 We had no idea how safe the Bahamas was, so we took precautions with our kids. We borrowed a sharpie marker from the service desk and wrote our kids' names and cruise ship name on their arms in case they wandered off, or heaven forbid, someone nabbed them. We also took a photo of what they looked like that day; what they were wearing and what they looked like not smiling. If kids go missing on vacation, having a photo like this will greatly increase the odds of the local authorities being able to help you locate your child. 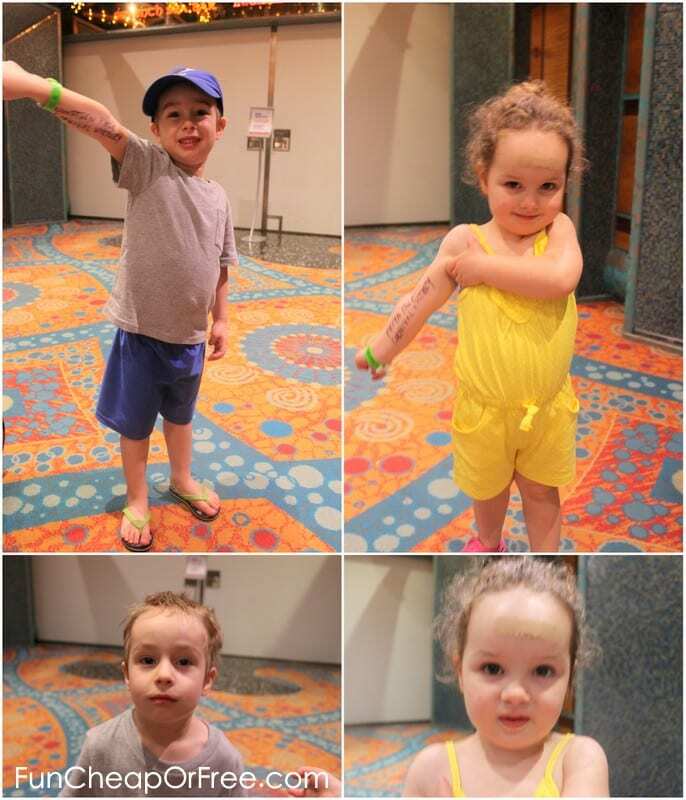 Before getting of the ship each day we wrote our kids' names and ship name on their arms in sharpies, and took a photo of what they were wearing/what they looked like that day. We hadn't bought any excursion tickets so we planned on just playing on the beach. We brought our stroller, ship beach towels, our beach bag filled with sunglasses/sunscreen/swim floaties/snorkel gear, and camera. Our ship was able to pull in really close to shore. We walked down the long dock, and landed right on the beach. The chairs were free, and were first-come, first-serve. We had no trouble finding a few chairs in a great shady spot near the water. 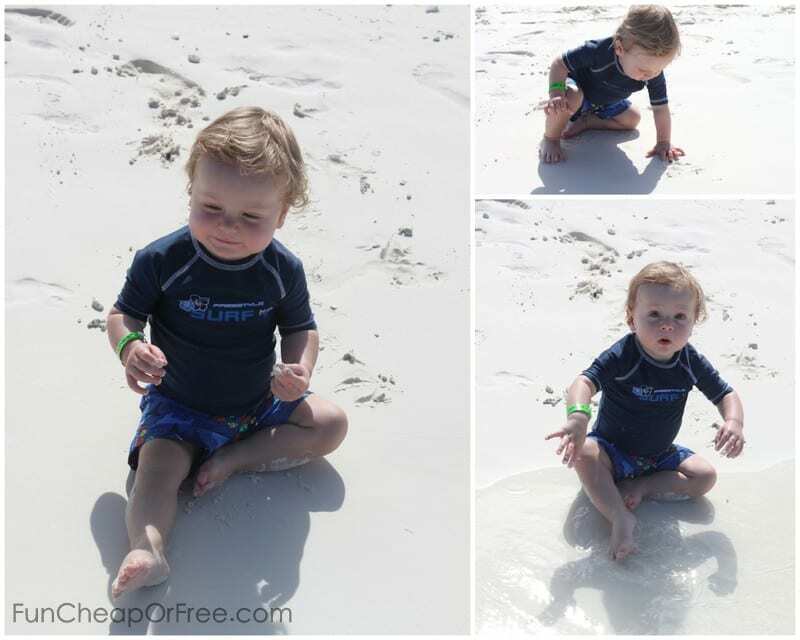 We tried to get the kids to swim in the ocean with us, but the water was too cold for them! Once their legs felt how cold the water was, they were not happy about it! A little boy was nice enough to share his sand toys with the kids. As mentioned in Part 1, I recommend bringing some sand toys. Kids don't last very long somewhere when they're bored. 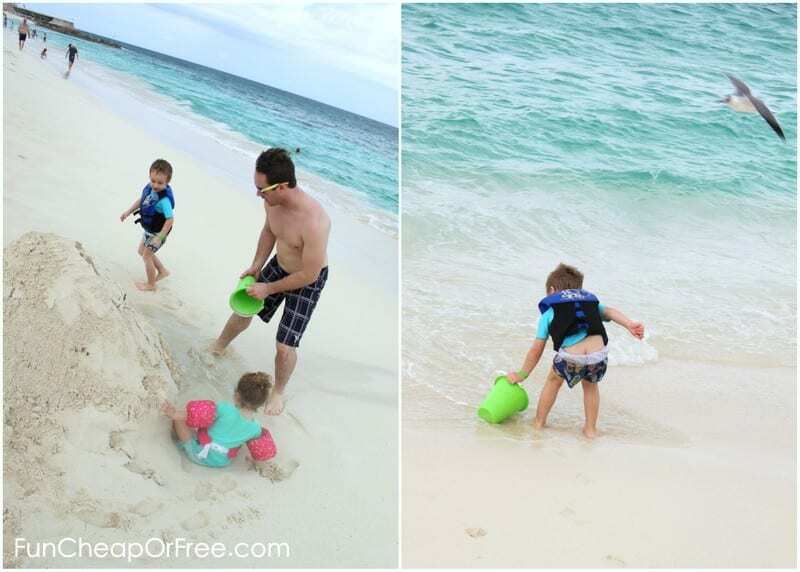 They played in the sand for quite a while, then got adventurous enough to swim with us. Once you got used to the water, it felt great. Can you see my two fishes out there?? The waves were pretty strong and the beach dropped off suddenly, so the kids weren't able to play in the water without us holding them the whole time. 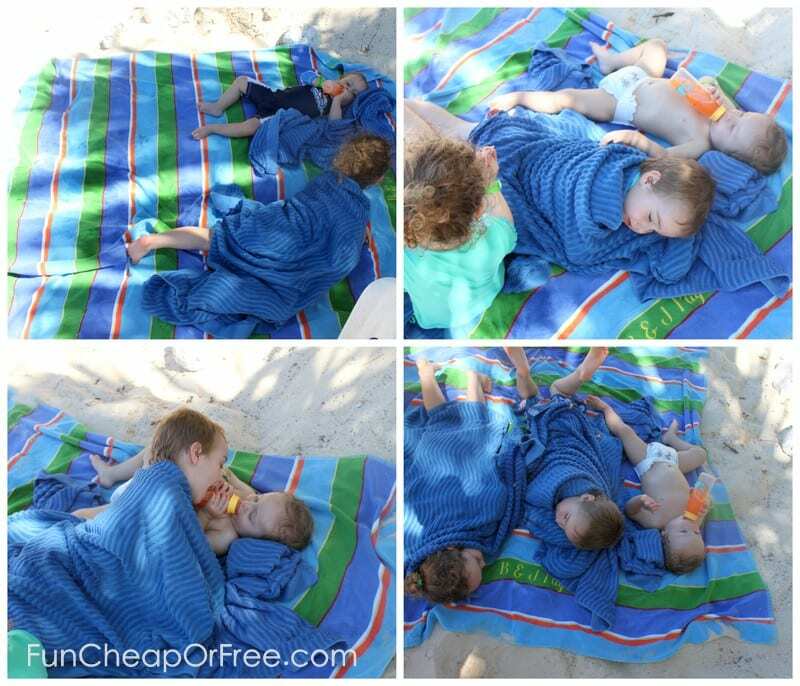 When they got exhausted and cold, we laid out the large beach towel/blanket we brought from home and let them relax for a while. I was hoping they would nap, but they were having too much fun with each other, so we just let it go. When our snacks ran out and they got hungry and cranky, we called it a day. We headed back onboard the ship, showered, we all took naps until dinner, we ate dinner, explored the ship a bit, then hit the sack early. We woke up to the most amazing crystal-blue water. It was like a postcard. After breakfast we got on the first shuttle boat that took us from our ship to the island. Arriving at Half Moon Cay. Hutch wore his floaties on the shuttle boat, he was so excited to go swimming. Day 4 will go down in history as the best beach day EVER. I LOVED this place! It's Carnival's own private island, so we had the entire thing to ourselves. 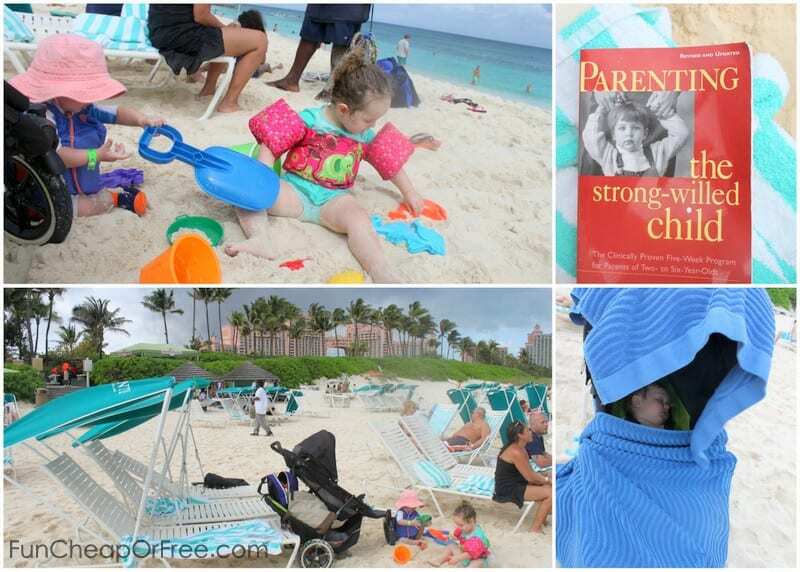 The beaches were soft, the weather was amazing, and it was SO family-friendly. They had a mini water park set up for the kids! Complete with mini water slides that even our baby could go down, and a splash/spray area in the ocean. The “family-friendly” side of the beach…virtually empty. P.S – notice Bubba pushing the stroller on the sand. We had to do that at every beach we went to, sometimes for what felt like miles. 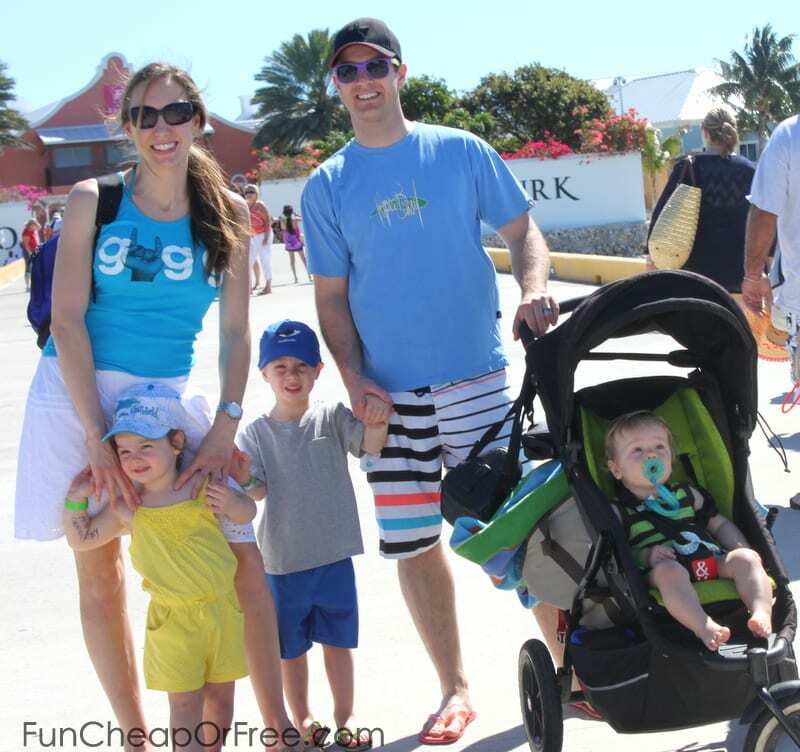 Jogging tires are a MUST in my opinion, when you take a stroller to a tropical vacation. They had plenty of free beach chairs. 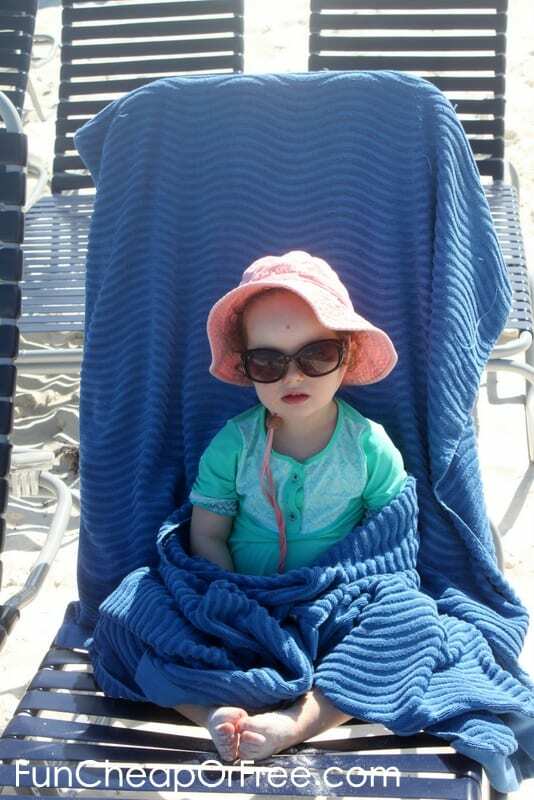 We paid $20 to rent a sun shade for the day because the sun was nice and hot that day. What I loved most about this beach was that the water was very shallow, and very tame. No waves, no currents, the kids could swim easily without us worrying about them nearly as much as the other beaches on our trip. Shallow water and virtually no currents or waves made it the perfect beach for kids to swim on. 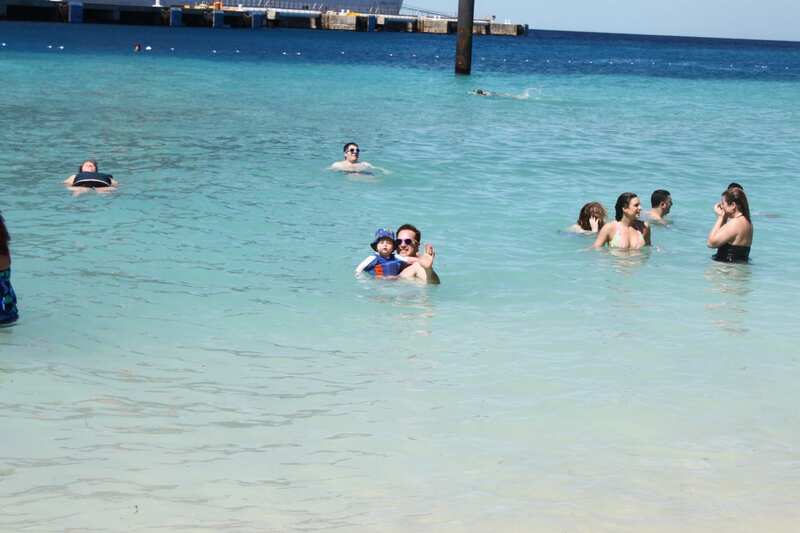 Since the kids could play without us holding on to them, Bubba and I were able to trade off and take turns snorkeling,. I didn't see any fish when I went out. Bubba, however, hung close to the rocks on the far left side of the beach and saw a bunch. 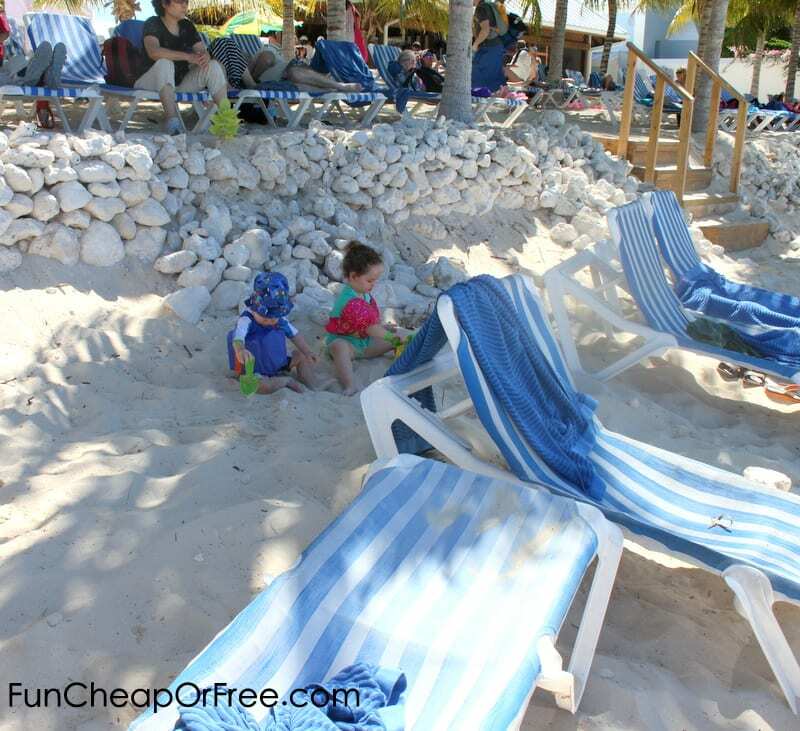 The sand was soft and free of debris, so between the water-slides, beach, and shallow water, we were able to sit back and let the kids take reign of the beach. It was so much fun. The water was even a bit warmer because the beach was so shallow. 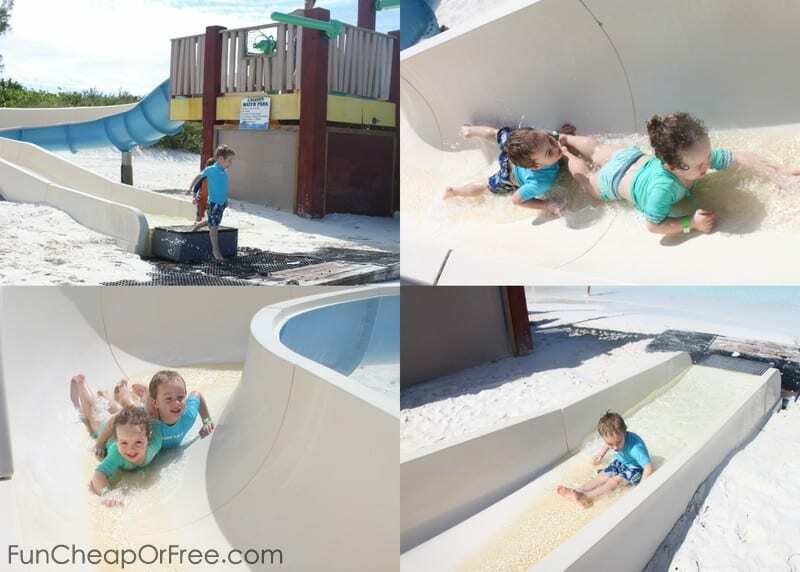 Kid-friendly water slides were right on the beach! For those with older kids, things to do on this island included a sight-seeing tour, and snorkeling excursions. For those with big parties, you could rent a private cabana for the day. Not sure if it's necessary because the island was great even without a cabana, but the ratings online were good. After a few hours the kids got tired and hungry. We wandered over to Carnival's complimentary island BBQ. 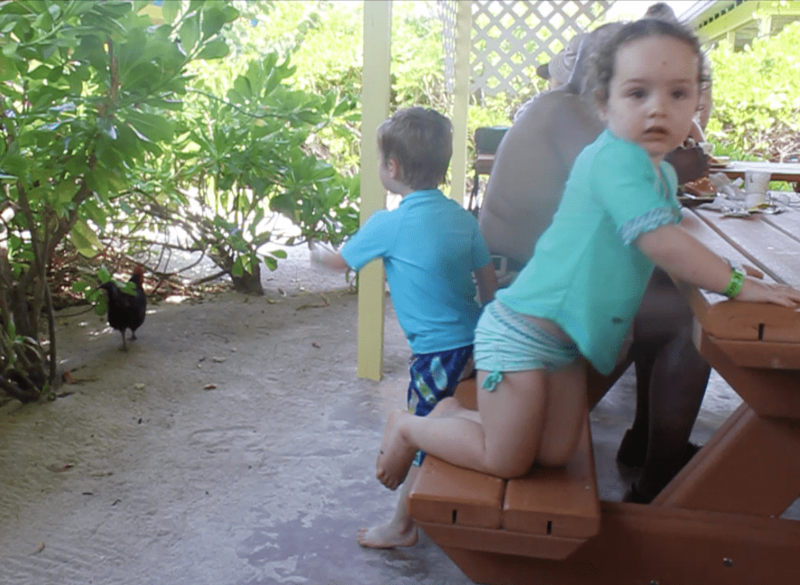 The kids loved that wild chickens and roosters were roaming so close. After lunch we headed back to the ship. Hind-sight, we probably didn't need to pay the $20 for the sun shade. Even though we used it, we were only on the beach for a few hours. We probably could have parked our stroller in the shade somewhere and had been fine. 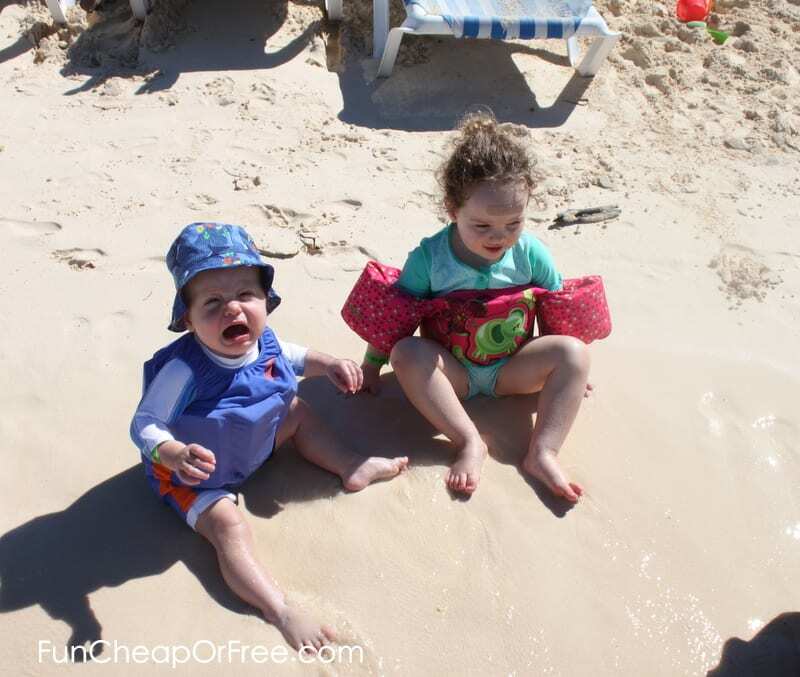 So before renting things, just remember that with kids, you'll probably only spend a few hours on the beach – not worth renting something for a full-day probably. We went to dinner, watched a family-friendly show, then went to bed. Nassau is the capital city of the Bahamas. It was fun to see a hustle-bustle city, to get a little variety on the trip. Once off the boat we walked through a bustling mini market where people were selling souvenirs, transportation, and tours/excursions. We hadn't purchased an excursion in advance or anything. 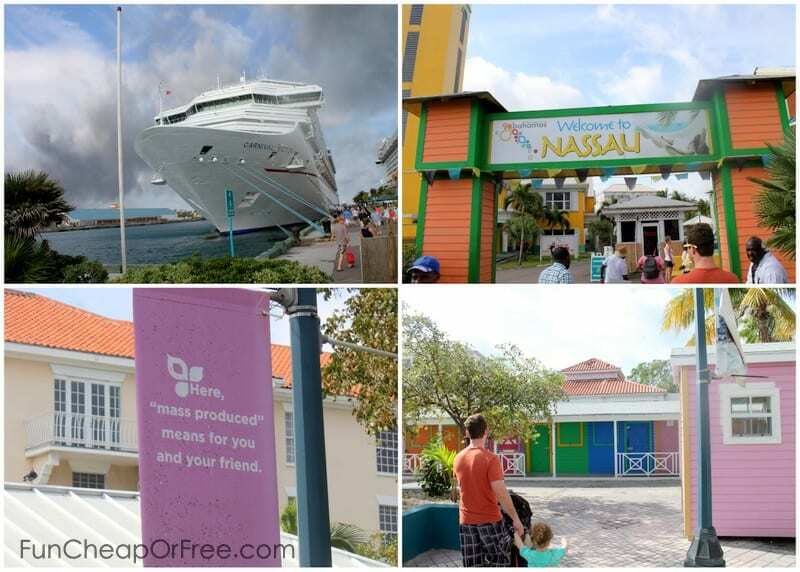 We knew the famous Atlantis Resort and water park was in Nassau, but the excursion was $170 per person! We decided to do our own thing. We easily hitched a taxi, and happened to get a great taxi driver who gave us a mini tour of some sights to see, and drove us to Atlantis. Waiting for the taxi, riding in the taxi, and getting a mini tour of the area from our fabulous driver. We weren't able to walk around the resort without buying a day pass, which was very expensive. So we found a nice spot on the beach right outside the resort, and had another fun beach day. The weather ended up being overcast and drizzly, so we're glad we didn't spend the money to go into the water park. The water was REALLY strong and deep, we wouldn't let them swim without Bubba holding them in the water. So Priya and I set out to buy some beach toys. The bucket of toys cost me – wait for it – $17. Ouch. For one bucket and a few scooper things. Again, see part 1 for what to bring…I definitely recommend bringing your own toys if you're traveling with small kids! It started raining and since the ship was so far away, we decided to buy lunch at the resort's really cool cafe. It was built to look like a cave, complete with an aquarium inside. Hutch, our little oceanographer, was in heaven. The food was ok. Way over-priced, of course. But it was a fun experience, and we were happy to be out of the drizzle. 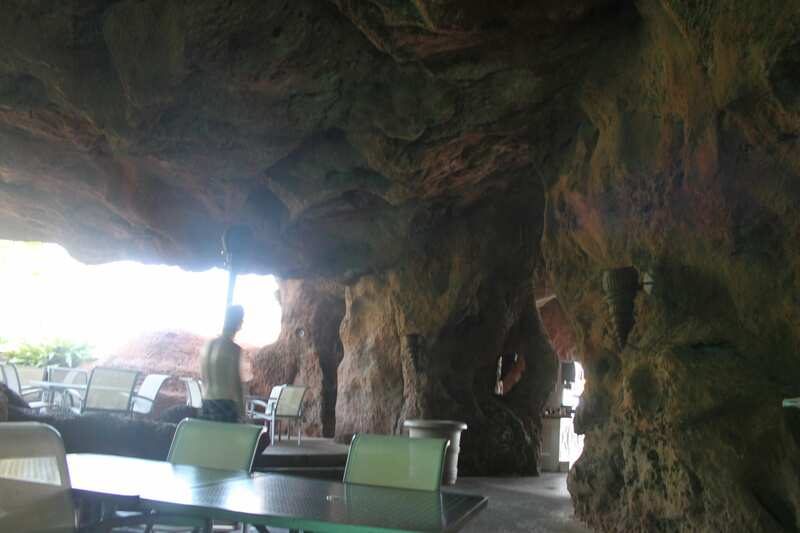 Eating at “The Cave” cafe at the Atlantis resort. They let us eat there even though we didn't have a resort pass, we just couldn't walk past where we were eating and through the caves to see the full aquarium. Our kids didn't know the difference. After lunch we went back to the beach and played for hours. I was able to get some light reading in. Reading, playing, and napping on the beach. You can see Atlantis resort in the background, the big salmon-colored buildings. Ps…Yes, I recommend that book! And a reminder to read part 1 where I suggest to bring only 2nd hand books on vacation, and why. The beach chairs were free, but they were stacked up and you had to tip a guy to set them up for you. I think we tipped him $5 for a couple of chairs. It was nice having the sun shade since it would drizzle off and on. When the kids were fried and tired, we headed back for naps. We were worn out! It was all we could do to pry ourselves out of bed at 6pm for dinner! It was our last night on the ship, so we got all dolled up and ready for some last moments of fun. P.S. really, how adorable is Priya's dress? I got it a few months prior from Zulily using refer-a-friend credits, turns out it was perfect for a cruise. At dinner it was sad to say goodbye to the staff that worked so hard for us all week. All week long our server, Pradono (whom we affectionately called Uncle Prado), talked non-stop about his son, Anthony, who was back in Indonesia. He missed him so much, it broke my heart. He is almost two, so Prado really connected with my kids. He even gave the kids one of his beloved blinky-lights that he would use for dancing each night (you can see it in the video). After dinner we went back to the cabin and got the kids ready for bed. We told the kids about Prado's little boy Anthony, and how he's away from his daddy almost all the time. The kids wanted to make Anthony happy, and picked a toy of theirs to give to Prado to give Anthony when he saw him next. We wrote up a little note, marched back into the restaurant (in the middle of the 8pm dinner seating), dressed in their footie PJ's, gave Prado a big hug, and gave him the note and toy for his son. It was the sweetest thing ever. Again, the staff works SO hard, often for very little pay. If I could do it over again I would pack some little gifts or treats to hand out to the staff, as a little token of thanks. They are fabulous! You have to pack your bags and have them out in the hallway by 10pm. So we had to pack an overnight bag with the things we would need until we got off the ship, so we spent some time doing that after dinner. Since it was our last night of the cruise and since we didn't have anything to do the next day, Bubba and I decided to be bold and have a night out! 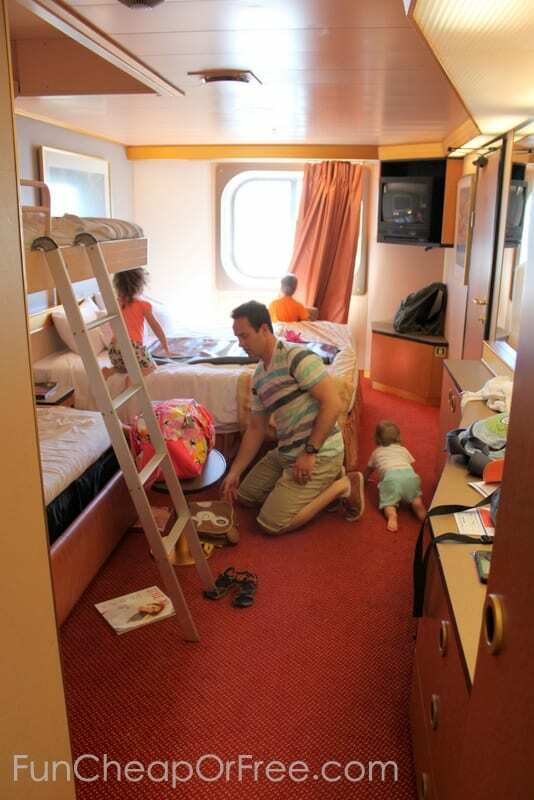 Camp Carnival on board offers babysitting from 10pm – 3am. Yes, you read that right. Our kids were EXHAUSTED by 8:30. But we went to the 9:00 family-friendly goodbye show to try to tide them over, then bolted to Camp Carnival at the stroke of 10. The cost was about $7 per kid, per hour. Since we hadn't really bought any souvenirs on the trip (other than overpriced beach toys…) we decided to splurge and have a fun, adult night together and consider that our “souvenir”. At Camp Carnival they had a handful of kids there already. They laid out lots of pillows and blankets out on the floor, and had Horton Hears a Who playing. 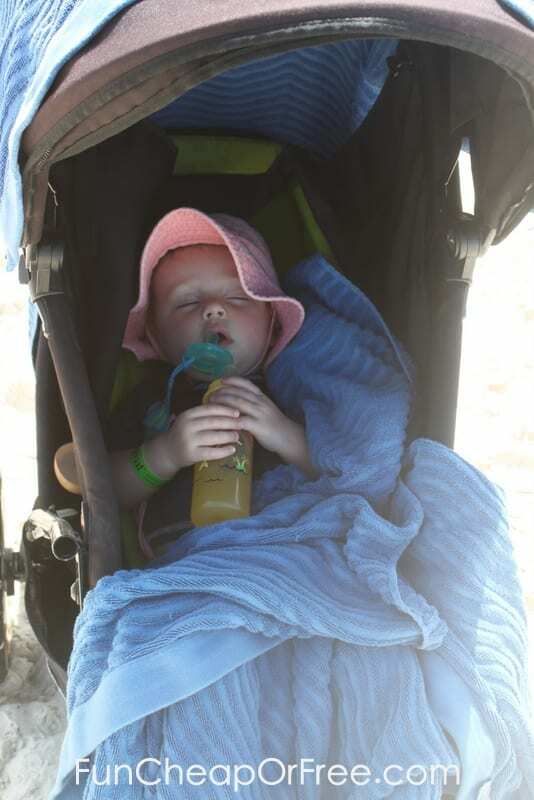 We left beck in his stroller with a bottle, figuring he'd fall asleep. Our kids DO NOT fall asleep during movies, so we figured if they fell asleep, great. If not, I'm sure we'd all survive. We signed some papers, they gave us a temporary cell phone to use as a pager in case they needed us, and we headed off. Karaoke with a LIVE band! So fun! 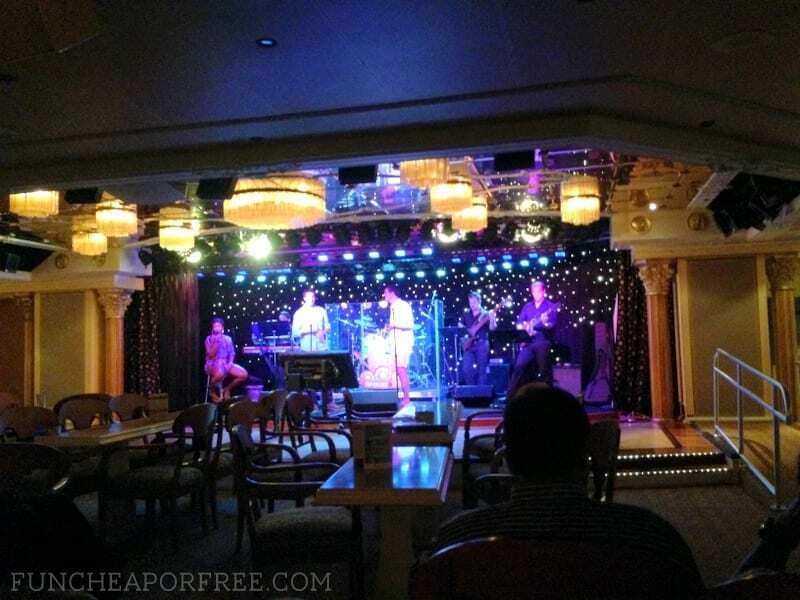 We hit up a live music lounge, karaoke (with a LIVE band! it was amazing! ), and went dancing. The two-hours we set for ourselves went by way too fast. It was super fun to be without the kids. When we got back Beck had been sleeping the whole time, so they didn't even charge us for him (which was super nice). The big kids were running wild, doing crafts, playing games with the other kids and eating cookies. Sleeping was nowhere in sight. Oh well, worth it! We had to be out of our rooms by 8 in the morning and hung out on the boat for several hours until it was our turn to get off the ship. The kids were pretty bored. We ran around and played tag with them for a while…but mostly they were tired and cranky and fought with each other. We were happy to get off the boat. We took a taxi to our hotel, checked in, and napped. We flew home the next night. See part 3 for all those travel details, and how we kept our kids entertained for over 8 hours of airports an flying! WHEEW! 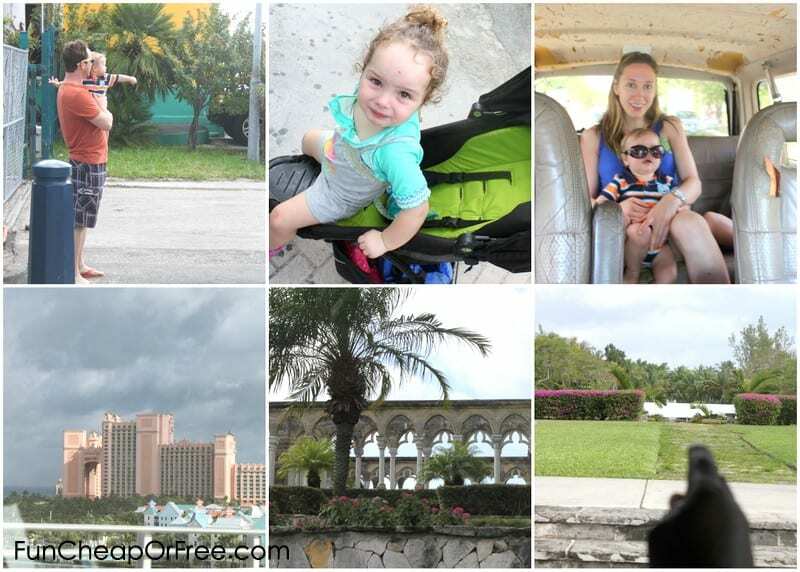 Now that you know every detail of what it was like cruising with kids, come back for part 3 which will explain how we survived traveling, hotels, and looooong flights with kids. Where did you get your black leggings? I love that length. Thanks! Thanks Jill! Honestly, I can’t even remember. I’ve had them for years, so sorry! But I recently bought some off of GroopDealz.com and Zulily.com that I’ve been happy with. This is great information! Thanks for taking the time to write all of this up. 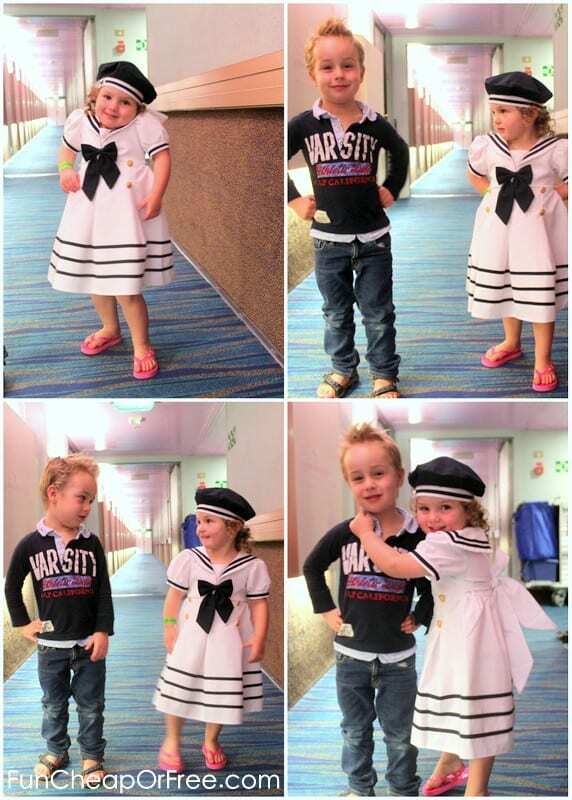 We did the Disney cruise a few years ago. I never thought I was a “cruise person.” (It was my in-laws’ idea.) It really was such a great way to travel with young children, and we all had a blast. I really recommend it. 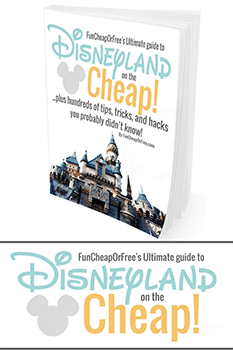 (Disney is more expensive but it sounds like more is included, such as the childcare, non-alcoholic beverages, and lots of the Disney stuff. It’s probably more like paying both for a Disney cruise and being at a Disney park at the same time, but we all felt it was worth it. ) 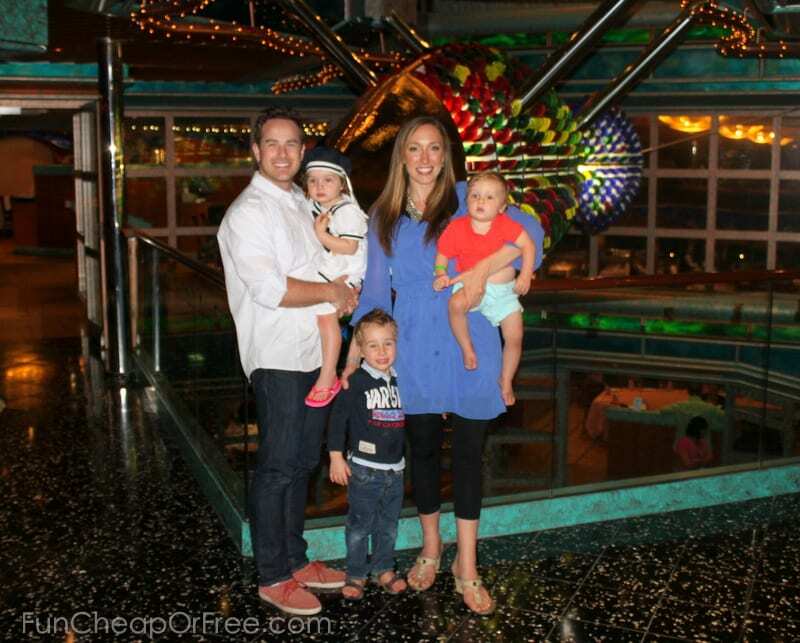 Anyway, my husband and I have been lucky enough to have parents that will take the kids so we can have a weekend away, but I think cruises are really great for families who want to have family time and couple time (by using the childcare). UGH I can’t WAIT to do a Disney cruise sometime. Sounds dreamy! It sounds like you guys had an awesome time! Loved reading about your experience. 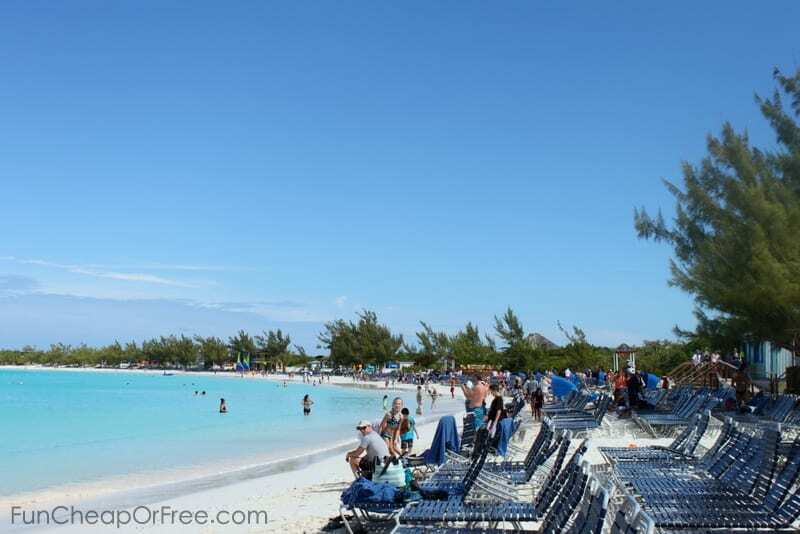 If you go back to Nassau, I recommend getting a day-pass to the Wyndham Resort at Cable Beach There’s a fantastic beach with shallow water and minimal waves, and a fun pool with a water slide. It’s not exactly Atlantis, but it’s a LOT less expensive (around $30 per person) and still a fun day. OH MY GOSH what a great tip! Thanks for sharing! 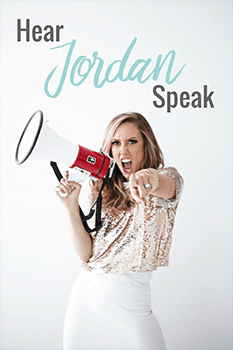 Jordan….thank you for taking me back! We did the exact same cruise 3 years ago (just after spring break, thankfully) and it was by far, hands down, no question the best trip we ever took! My first cruise too, so it made it even nicer. I felt the love and soaked up the pampering! Dining was exquisite! Half Moon Cay was my favorite too. As I was walking I realized I was in the midst of a Dan Makin painting….it really WAS real! Hahaha! You’re amazing for putting this whole thing together for everyone. I thought this was great information!! Thank you for taking the time to write about your experiences! This has made my planning a lot easier. Somethings you said, like fix the problem before you go should be no brainers, but we get so caught up in the planning we forget the most basic stuff! Wow! Thank you sooo much for this series! I have always been turned off to the idea of even staying in a non-suite hotel with our two girls But this is definitely making me feel like it is manageable! Thank you for all the time put into this. We could cruise very cheaply as we are already in the east coast! I’m definitely keeping this in mind when we plan our next vacation!! 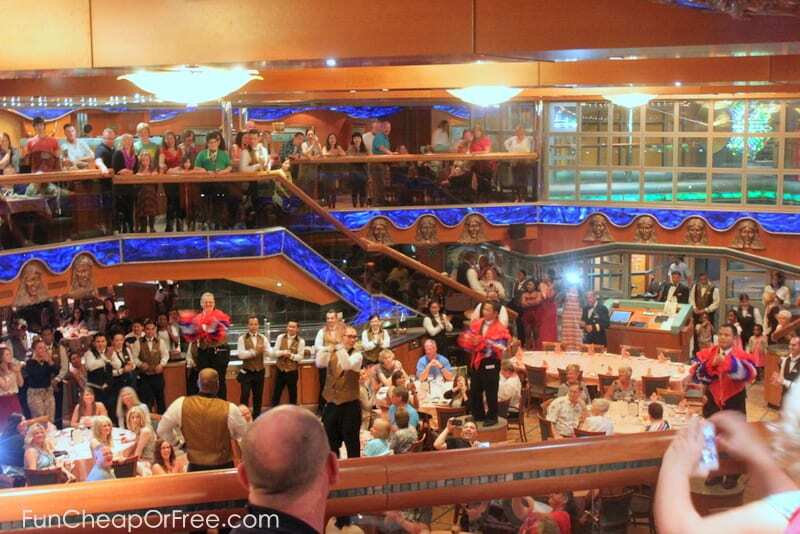 Oh boy, you are SO LUCKY you live on the East coast…you have the best cruises! 🙂 Glad you enjoyed it, thanks for commenting! Wow! This series is like the motherload of info. I’m amazed you got this done in 3 weeks. I’m glad you can be so relaxed about traveling with kids. Traveling with kids is definitely a stresser for me. 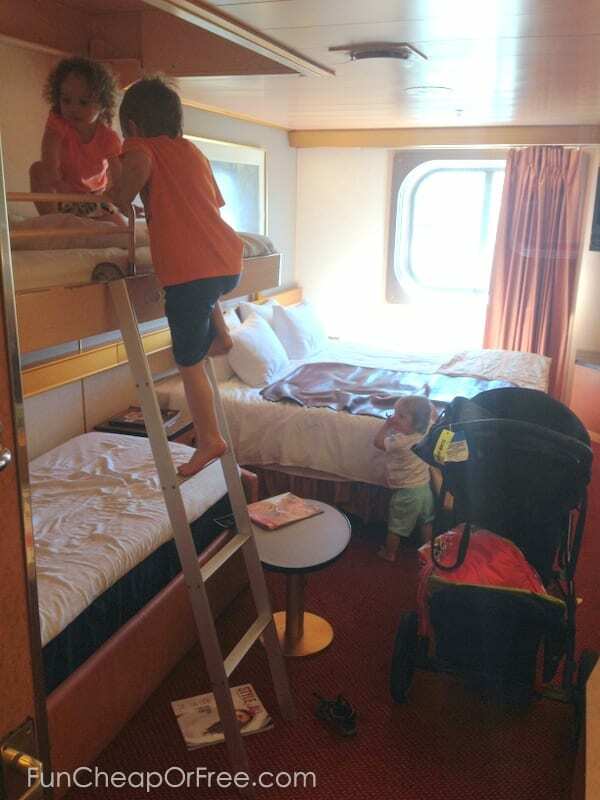 The hubster keeps bringing up cruises because he thinks it would be a better way to do it with kids. This makes it sound like he’s right. One tip I’ve found helpful with kids and souvenirs is to buy them before hand-much like the sand toys. Get special toys or the like before hand and give them to your kids while on the trip. The memory will be of the trip and not cost an arm and a leg. Plus you already know how much room they take in luggage! Oh my word that is a GREAT tip!!! I’m going to find a way to wiggle that into part 3, thanks for sharing!! 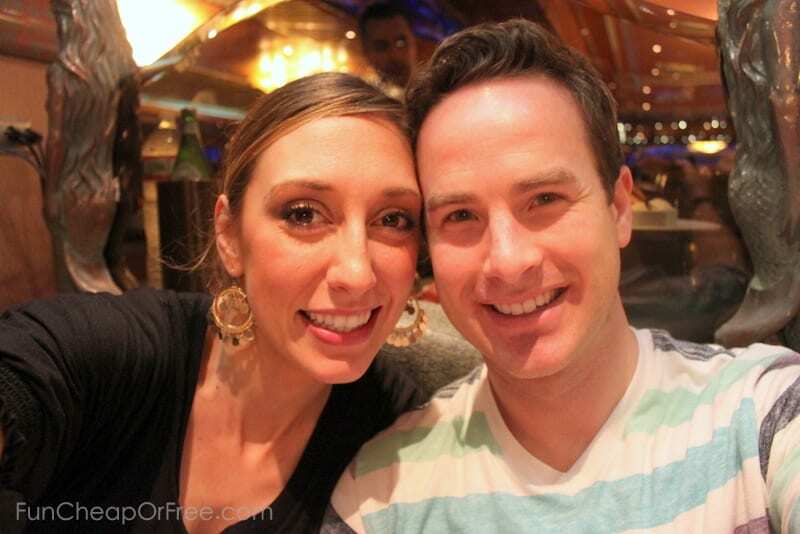 My husband had always wanted to go on a cruise, but I have been absolutely against it…until I read your latest 2 posts. 🙂 We have 4 young boys, and since we are in FL anyway, I think we are going to start saving up to take a trip of our own! Thanks for working so hard to put this series together for us! I’m going to start a spreadsheet of cruise tips now. P.S. Great idea to bring dinner clothes that didn’t wrinkle! Awww, thanks for reading and thanks for sharing!! Since you admitted that dinner was perhaps the hardest part of the cruise (it was for us the first night of our cruise too! ), you really should have taken your two older kids the ships kids club each evening. 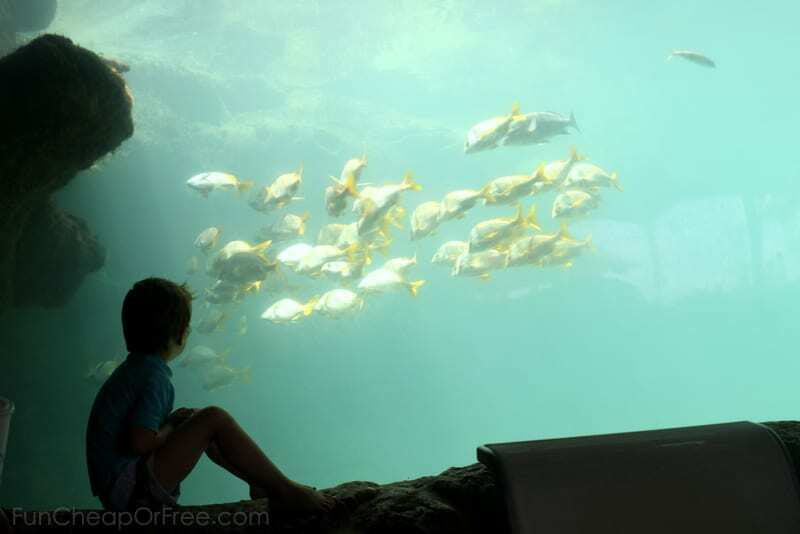 They feed them dinner and have tons of fun activities that my four year old just LOVED! And as long as you pick them up before 10pm (the night-owl hour), it’s totally FREE!?! Our boy was much happier there each night than sitting through a two hour formal dinner. We did have to keep our one-year-old with us as she was too young, but one was easier to deal with than two (or three in your case!). Something to think about for next time. 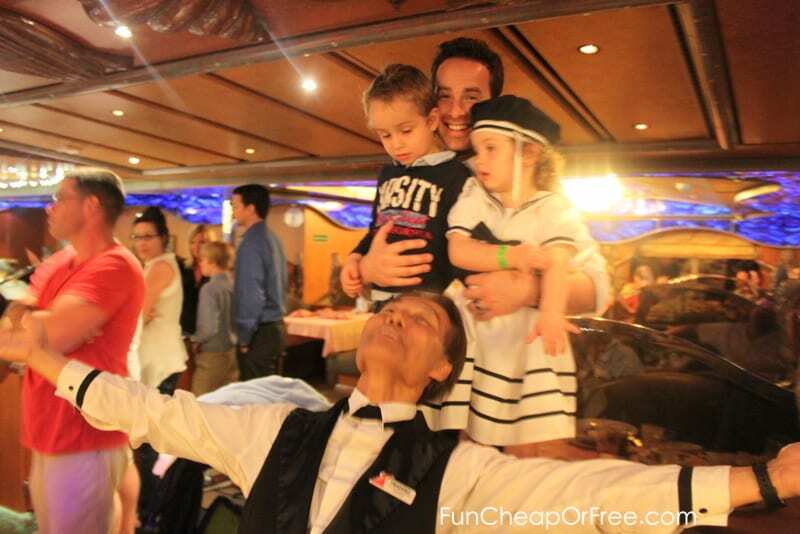 And I must say, even after reading through your “cruising with kids” account, which was very similar to our experience, while you say you loved it, I’m still of the opinion that it’s still not worth it to cruise with kids that are so young that they will never remember it. 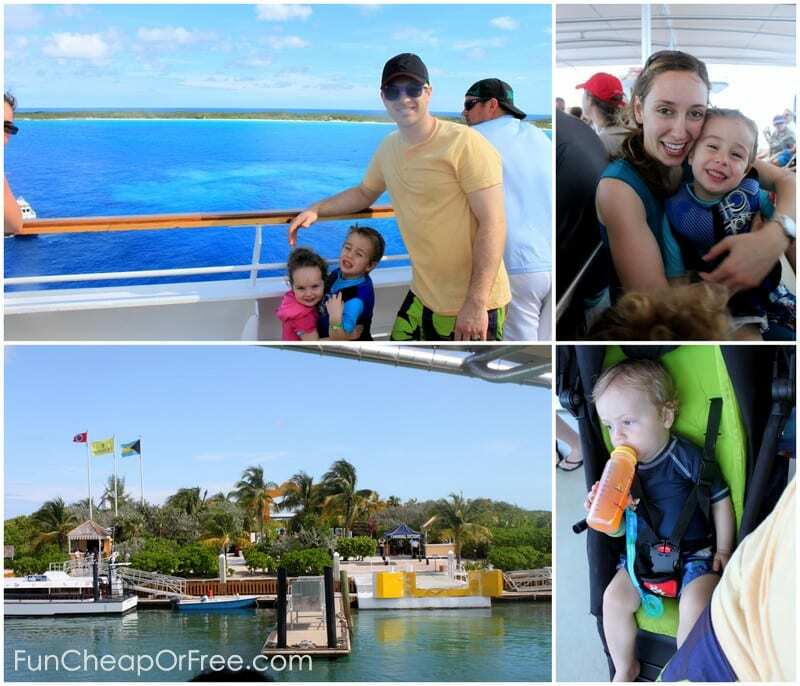 While cruising with small kids can certainly be done, if it’s not a family reunion cruise (which ours was…the kids really did need to come on ours), it’s totally not worth it. They’d be happier staying at home with grandma and the parents will have a much better time cruising without them. We just went to a Carnival cruise that was 5 days and even though we had a great time, I’d definitely splurge and go Disney next time. Though it was fun – we were definitely the ONLY ones with kids or only ones our of maybe 5 couples and I think we were the only ones who actually brought our kids off the boat hahahaha. I also didn’t think the “family friendly” thong show was entertaining – even if the costumes had been better hahaha. The pool we were at was ALWAYS packed with young Spring Break type folks and it was fun to talk to drunken 20 somethings but not my idea of a good time at the pool with my kiddos. We talked to random cruise goers who were on the Disney cruises and they said their shows were all AMAZING – I imagine it’s like the Aladdan at Disneyland that is just awesome. We loved the food and the staff, and the corny photos with 90’s -esque backgrounds – we also loved the amenities on the ship that we had – but we definitely would go Disney in the future. They had a firework show one night and lots of really fun kid activities – I visited the kids club thing on our ship and it seemed pretty lame, so I’m glad we took our kids with us most of the time. So much fun reliving our trip by looking at your photos – also did you know that for dinner, you can order as much as you want? Even the fancy dinner – you can have two appetizers or three or four or however many entrees you want? We learned that hehehe. fun fun! The appetizers were my favorite and the hot chocolate at dinner that had foamy steamed milk on the top mmmmm. Yum yum yum! Awesome take! Can’t wait to try Disney someday!! My family is planning a cruise in December and I was so happy to read post 1 and 2. I have cruised once before but this will be the first time for my husband and our 9 year old son. You made everything sound FANTASTIC! What a great piece and the information is priceless! PS my brother just came from Disneyland with his wife and two girl s (6 and 4). My brother said it was horrible! The girls got to see princesses but other than that VERY disappointing. In two days they rode 3 rides because it was packed and not in a good way. did you use a car seat for your littlest one on your trip. We are planning a cruise next year and a car seat seems impractical in a small cabin. No, we left our car seats at home and just took shuttles and busses that don’t require car seats. We actually found a shuttle that had a spare car seat that they brought for us to get us from the airport to the hotel! So it wasn’t a problem at all. Thank you for some great ideas! This is such an amazing article. Very well written! Thanks for all of the great tips and tricks! Fantastic write-up. Thank you so much! I also loved seeing pictures of your cabin. 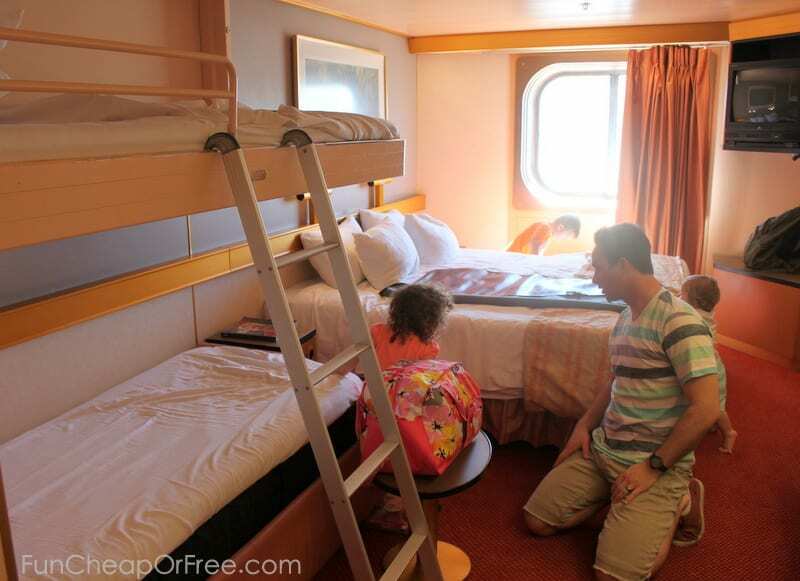 We have a similar cabin for our cruise this summer (Alaska with 3 1/2 and 1 1/2 year olds). 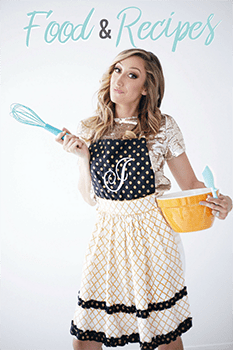 Thank you for the amazing write up! I appreciate all the details! 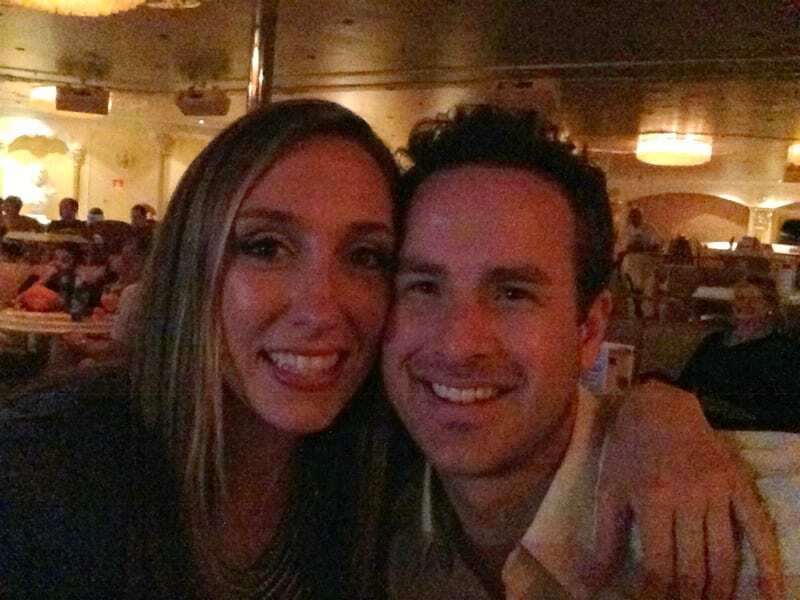 We are headed out on a cruise in July with two kids. One of our stops is Nassau. Quick question… when you visited the beach at Atlantis… did you just hop in a taxi and ask to be dropped off at Atlantis? I am just trying to figure out “what to say” in order for us to get to enjoy the beach like your family did! Again, great post and tips! I appreciate each and every one of them! what carnival boat did you ride on? 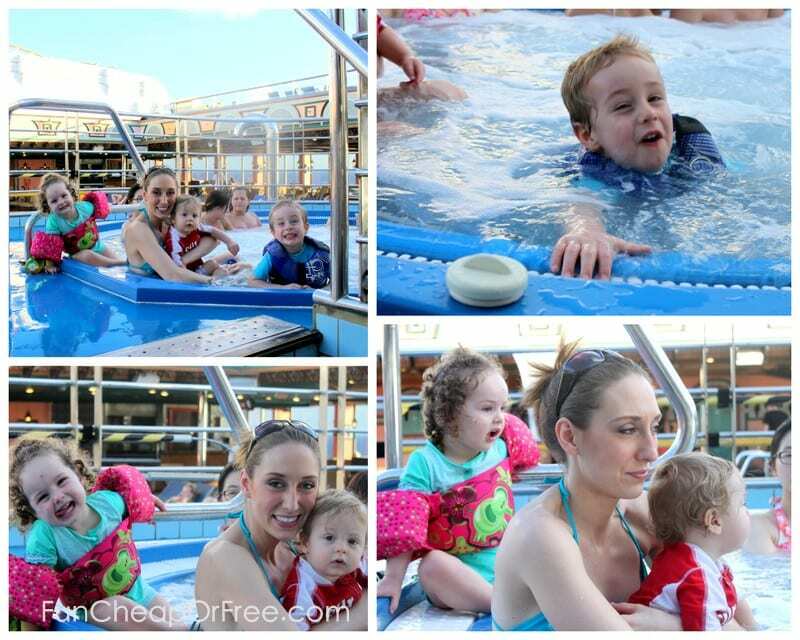 Infants & small children should never be in hot tubs, neither on land nor on ships, neither w/ or w/o supervision. Their temperature regulation is not suited for a hot tub. In addition…those in diapers of ANY kind, including “swim diapers,” as well as infants and children obviously too young to be toilet-trained (i.e., your baby) are forbidden by CDC/VSP policy and Carnival policy, from entering cruise ship pools and hot tubs. By law, they are only allowed in “splash zones” where their diapers are not submerged in water. Disney ships have separate small & shallow pools for these kids. There are signs on every ship and policies on cruise websites informing folks of these rules for cruise ship pools & hot tubs. So, I must have read this post 100x before our family cruise. What a lifesaver!!! I packed sand toys, tablets and all the goodies that were suggested. THANK YOU SOOOOOO MUCH! I don’t think that my prep could have been any better! 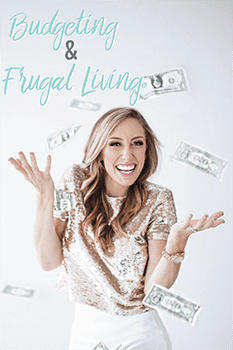 This blog was amazing! and made our trip so much more enjoyable! That water looks so blue! Looks like a blast. 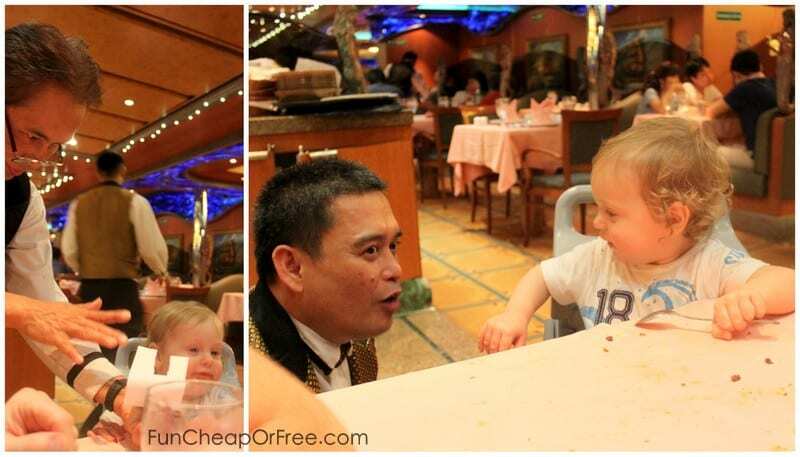 This is seriously the BEST blog I have seen written about cruising with kids! 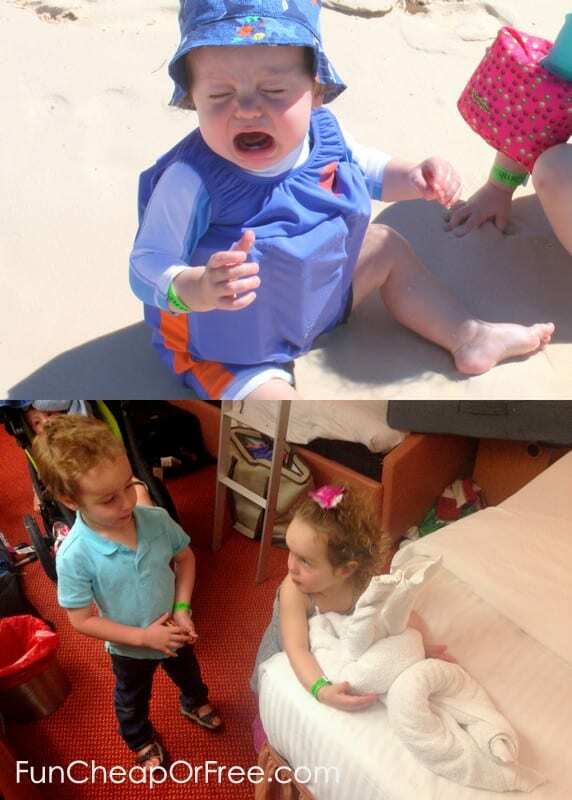 We went on our first cruise last year and decided we HAD to bring the kids, but the planning side of me was screaming because I had no idea how I was going to pull this off! You have given me everything I need! Thank you so much! So bummed to learn that babies are not allowed in pool!!! How did you get around this?